So I wasn’t as productive on the weekend as I had hoped, primarily because I decided to prioritise a social life above being a hermit, which is a real pain when you’ve plenty of miniatures to paint and terrain to build! I did, however, glue my tree trunks into their bases. I didn’t get around to using wood putty to make the round balsa look more like an actual trunk though. I’ll post about these at some later date when they’re done, or nearer to being done perhaps. 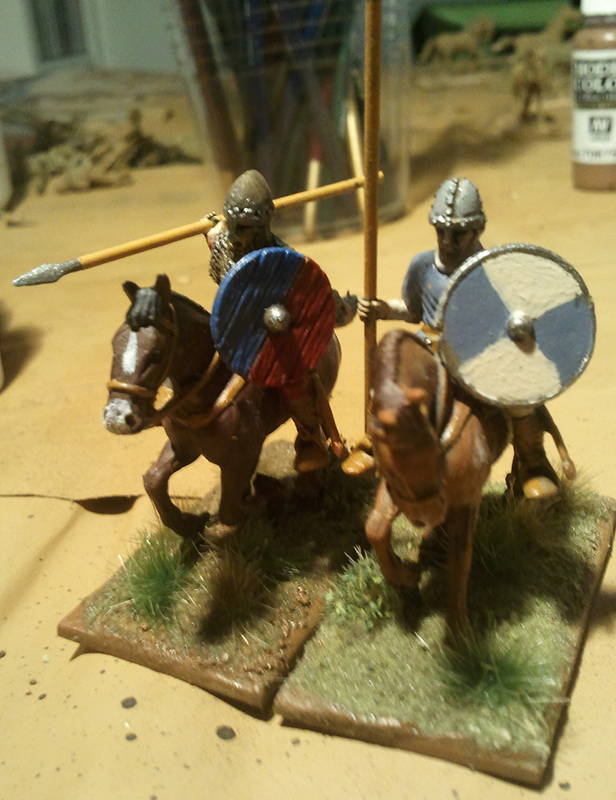 The other thing I did was paint a couple of Norman Knights. 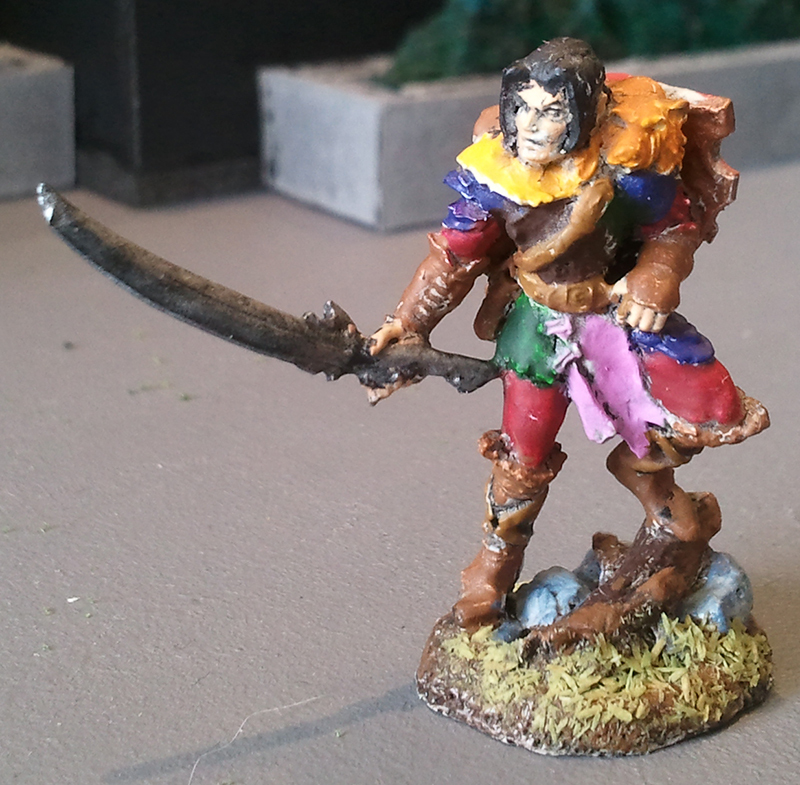 I’m pretty pleased with the results, the miniatures are really easy to paint and look great as I have mentioned previously. I’m not really sure what I’ll be working on over the next week. 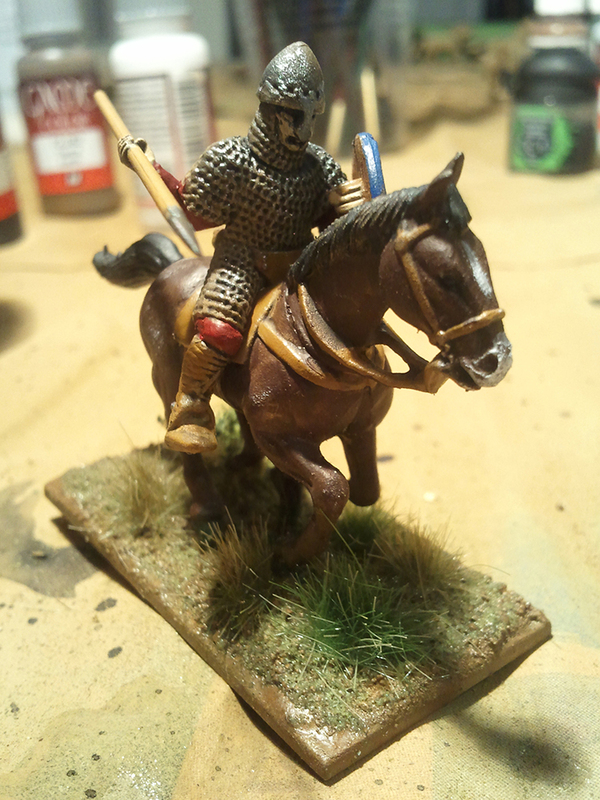 Probably more Norman knights, though I also undercoated my Soviet blisters. This weekend we look set for Warhammer Fantasy Roleplay (2nd Ed), but I’ll see about doing some work on those trees. Till then, happy wargaming! The Weekend and What Next? So the bad news is that the FoW battle I promised (and was very much looking forward to) never eventuated. My mate had a Big Night on Friday night and wrote himself off for the Saturday. Meanwhile I had a Big Arvo on Saturday and wrote myself off for the Sunday (been a long while since I’ve done that!). So good and bad really. What I did do on the weekend, however, was get myself some Norman knights, some new brushes, a can of dark yellow Army Painter spray and some Nuln Oil (G Dubs black wash, I like inks and washes in pots rather than dripper bottles, the only time I’ll buy G Dubs paints these days). 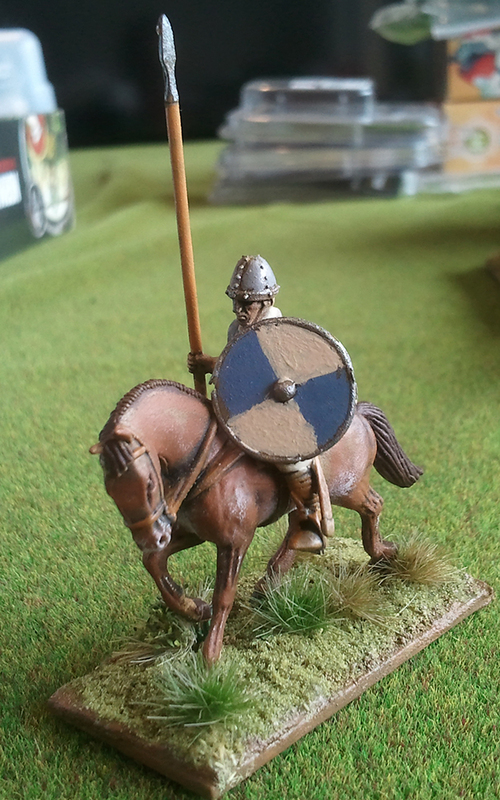 The Norman knights I grabbed were a box of the Conquest Games ones (these are available on Warlord Games website too). You get 15 hard plastic knights, plus bases – except these are four singles and four doubles, luckily I had some singles laying around for other reasons so I’ve enough for each rider to be based solo. 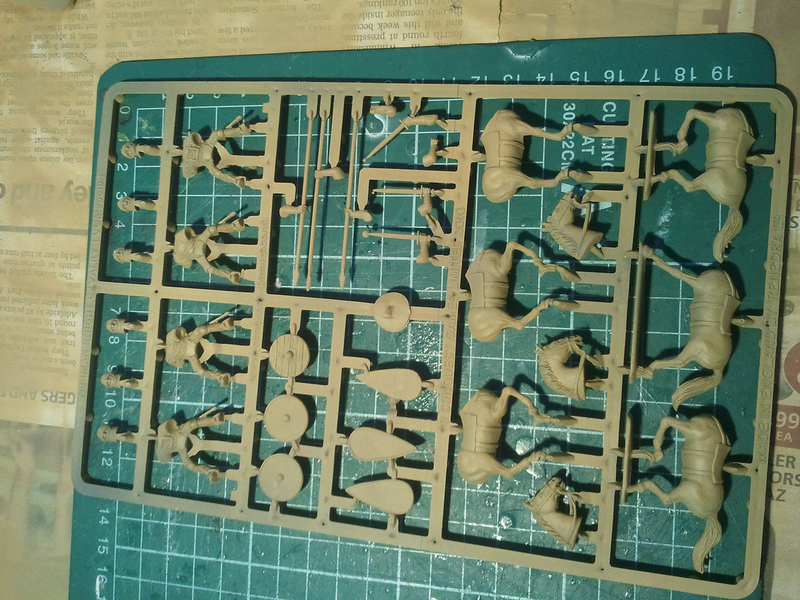 You get four of the above sprue, plus one other sprue with three horses (and the bases on another). 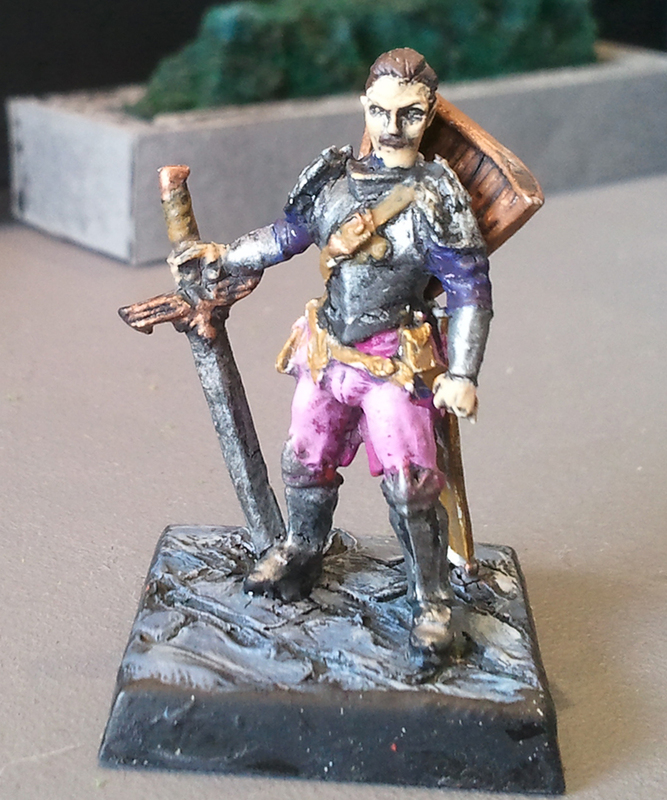 The models look nice, with good detail. There are four body variants, three with mail hauberks, one unarmoured. In the above image I’ve used my dark yellow Army Painter spray to undercoat (they were out of grey, but stuff it, I’m really taking to yellow after my DAK). I’ve assembled eight so far. 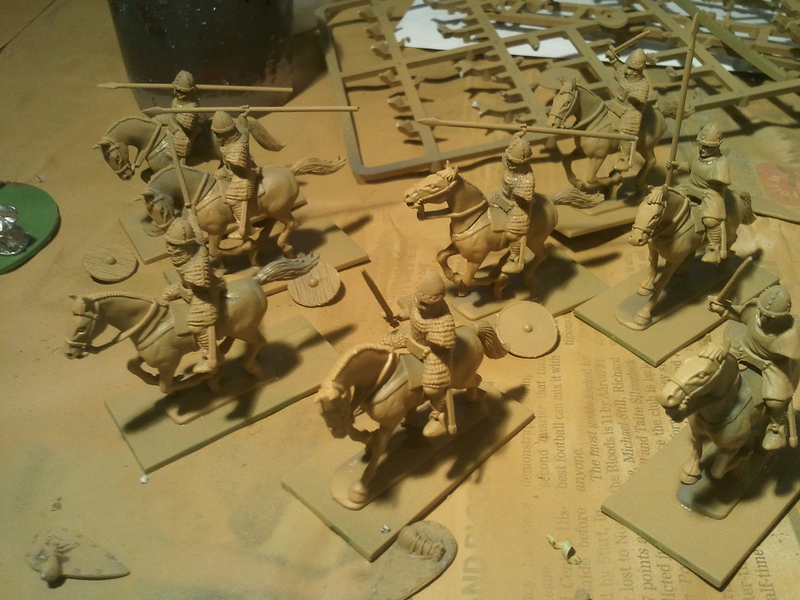 They aren’t glued to their mounts and their shield arms are separate (for ease of painting purposes). I plan to assemble the rest over the week, fill out the bases and be ready for painting on the weekend. 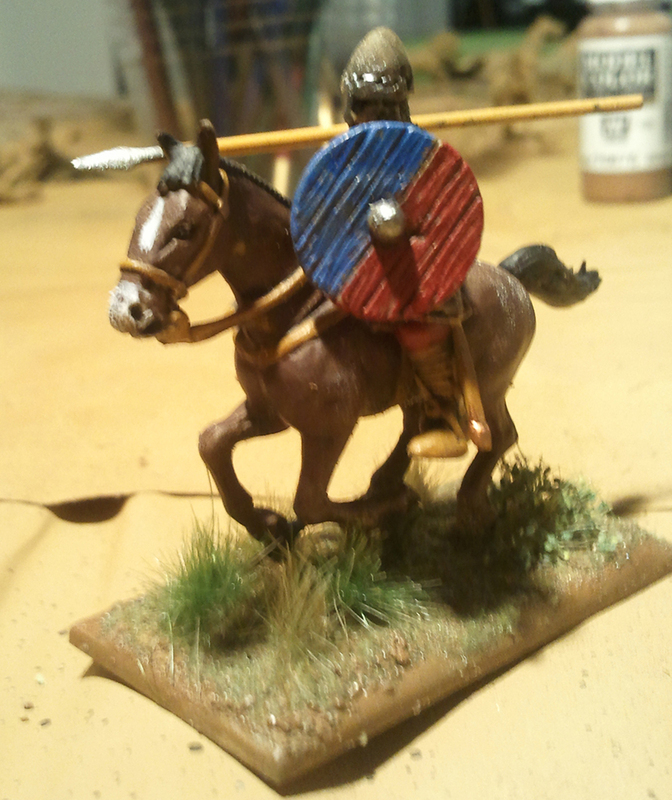 I’ll probably do a bit of reading on painting Normans too. 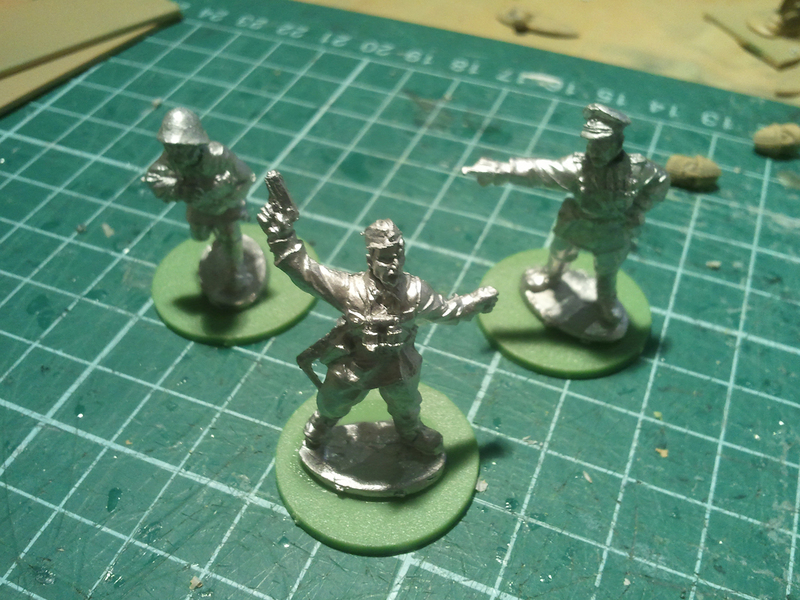 Other than the the task of assembling my knights, I’ve also got my Soviet Bolt Action blisters ready for undercoat: maxim MMG, 82mm mortar and the command blister (which contains two officers of different rank and a medic) – as you can see below. Again, I intend for these to be painting ready come the weekend. Not sure what I will start painting first though. So in terms of what next, I’ll probably post something about painting these things in the next week or so. This weekend I am thinking of doing a little project I’ve been thinking about for a while and making some trees, except that I don’t really have the paint for it, so I might head to Spotlight and pick up some more tubes of cheap craft paint. We’ll see how things go and report back in Friday’s post. 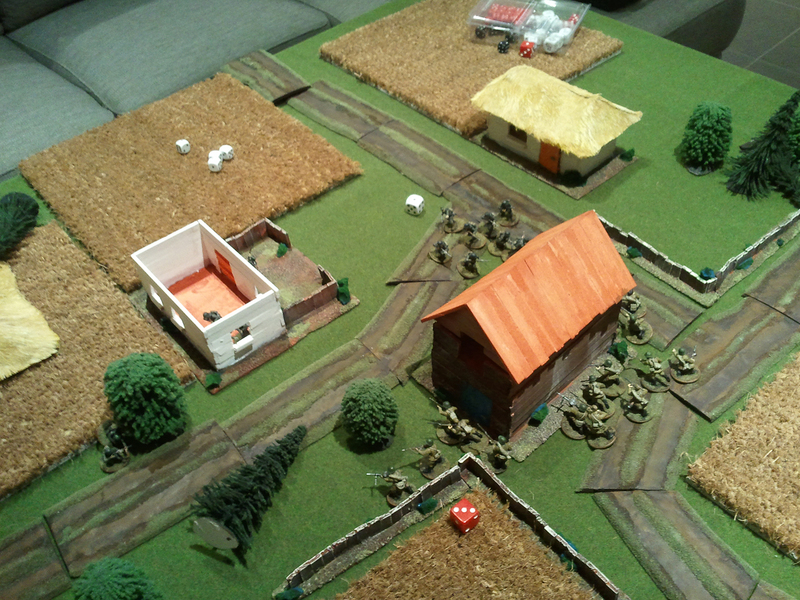 I’ve been quite busy this week, but other than finishing my farming commune I was able to get in a small Bolt Action skirmish against myself using my new terrain. Not having actually played Bolt Action before I did make some mistakes, or rather forgot to do things, but these were as much a result of playing myself as my unfamiliarity. I was using only what I had, which consists of a single box of infantry for each force. The full contents of each box were used, except the Soviet PTRS. 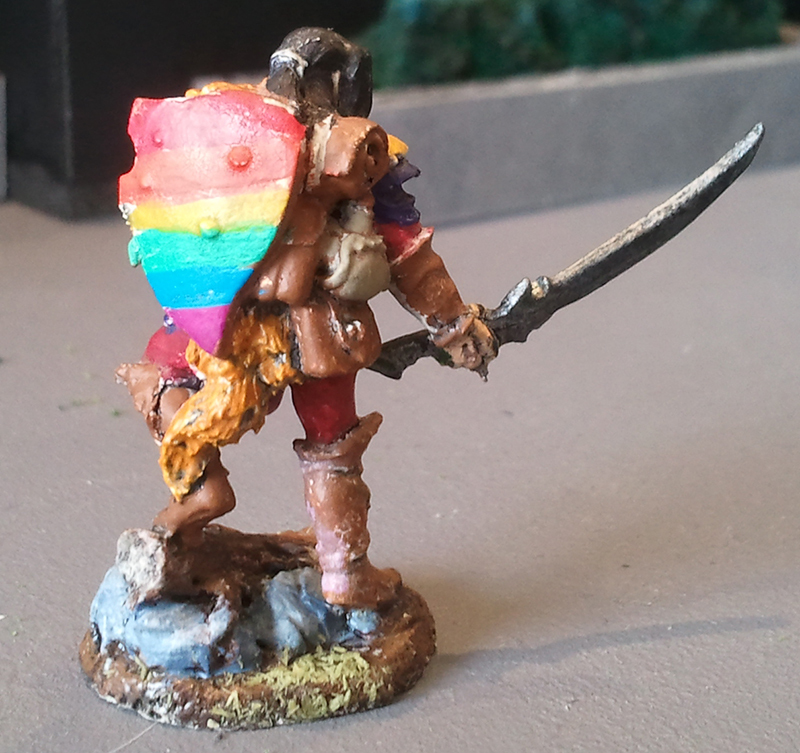 I am really pleased with the ability to do this, in fact it was one of the things I noticed when I purchased my box of Soviet infantry. 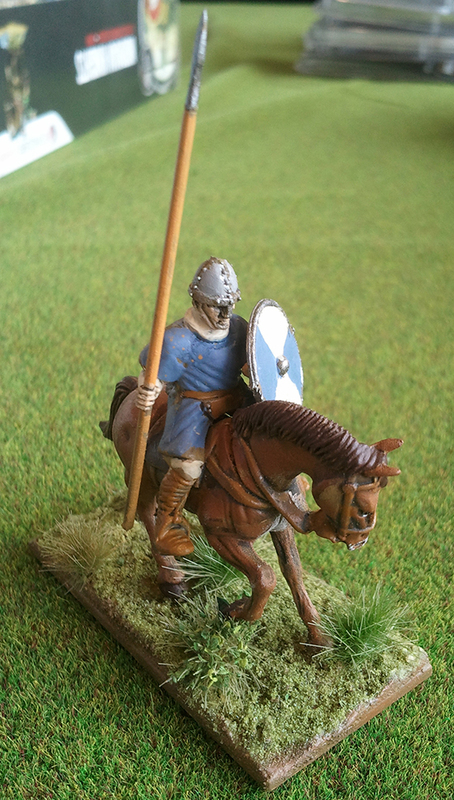 Warlord Game’s combination of good looking miniatures at a great price is very welcome! I used only what I had, less the PTRS, and as they were represented, expect the models with SVTs (Soviet semi-auto rifle) which I counted as Nagants (bolt action rifle). I chose to play Maximum Attrition from the rulebook: one victory point is awarded for each enemy unit destroyed, the side with at least two victory points more than the other is the winner. In the case that this is not met, the game is a draw. The game lasts for six turns, with a seventh played on a 4,5 or 6 at the end of turn 6. I set the table up with the barn in the centre of the field around which the other buildings and fields were variously arranged. My FoW rural roads are just wide dirt tracks at this scale. The fields and trees are also FoW scale, but do the job. The table is 1200mm square (4’x4′), which demonstrates just how much space a few buildings can take up with the supporting infrastructure. I’m really pleased with the result, these images look a lot better than the ones of the buildings without any tracks/roads! 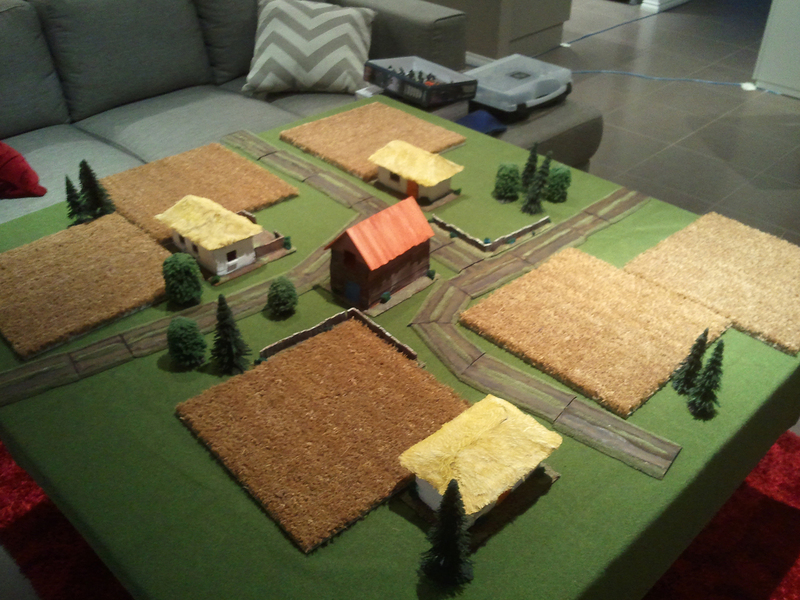 I’m definitely going to need to prioritise making some rural roads for Bolt Action! Turn one was spent moving every unit onto the table. Everything ran and the resulting battleline was (for the Soviet) one regular squad on the far left flank, inexperienced infantry in the centre, with the HQ behind, second squad of regulars on the right and sniper team on the far right. For the Germans the right and left flanks held the two infantry squads, with the HQ and sniper team positioned in the centre. 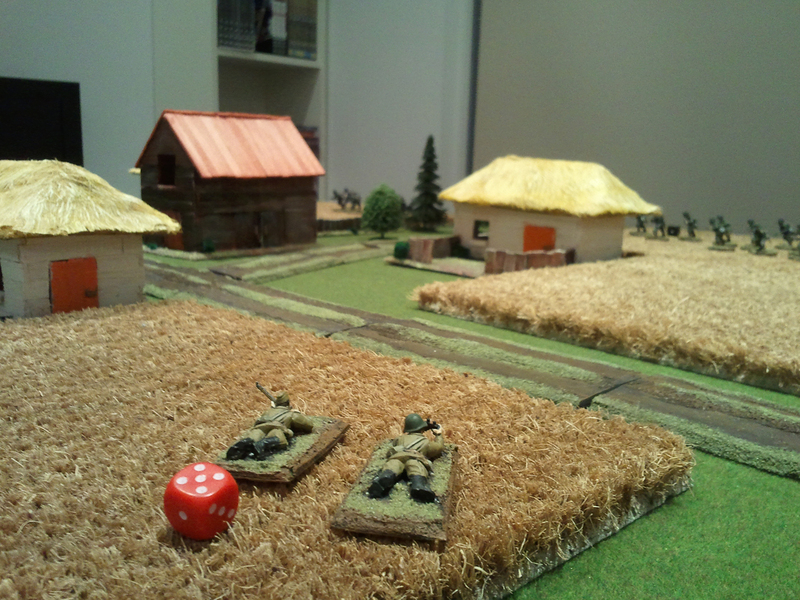 Images from end of turn one: Soviet sniper position, Soviet line and German line. Everyone advanced in turn two. The inexperienced infantry had the first order and shot at the regulars on the German right flank. They needed 7s to hit, so 6s and 6s again and I rolled five 6s out of 12 shots on the initial roll! Unfortunately none of those five were a 6 the second time round. In reply, the German infantry opposite them advanced and managed to kill three of the inexperienced infantry in reply. The Soviet regulars on the left moved up and picked off managed to put a pin marker on the Germans, but scored no kills. The other Soviet infantry squad moved up to the right of the building nearest them, putting them near to the centre of the field – this would be the first mistake I made with them. The German infantry on the (German) left flank killing the Soviet sniper team. I may have made an error here though, they actually needed 7s to hit, but I may have rolled thinking I only needed 6s. The resulting fire killed one of the two man team and then the sniper himself failed his morale roll (for taking 50% casualties from shooting) and fled. First VP to the Germans! 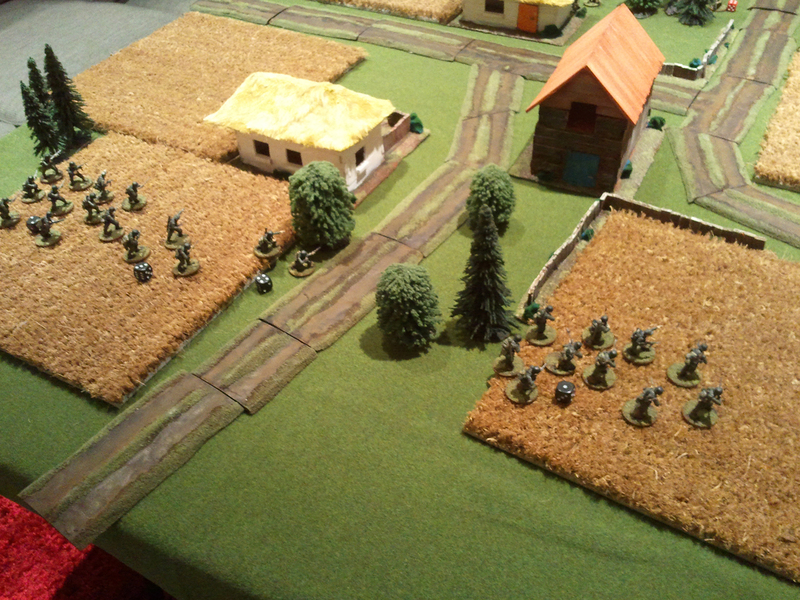 The German sniper missed the infantry in the middle and the two HQs moved up. The above images are from the end of the turn (German right flank is in the left image, the left flank in the right image, just to be confusing). 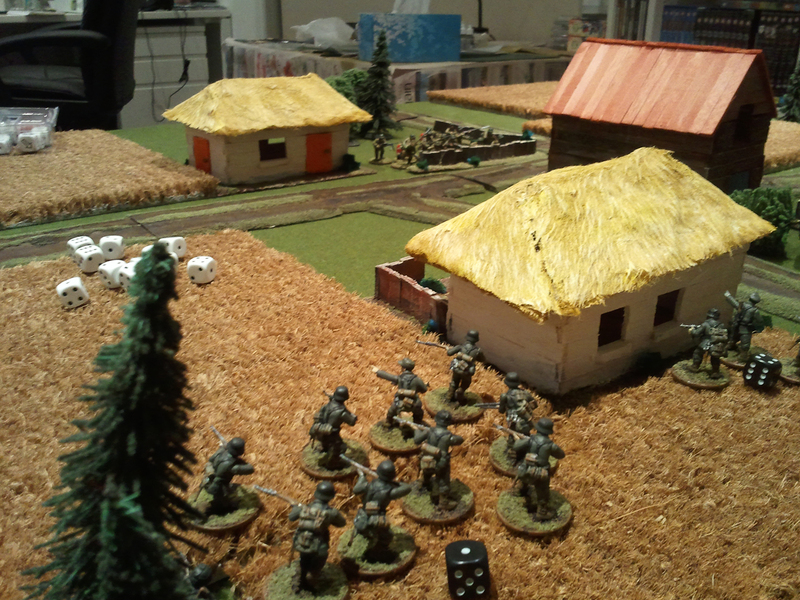 In hindsight, the right hand Soviet infantry should have moved around the right side of the building – or even into it – and I should have either assigned my first order to the sniper team to ambush, or not moved up the sniper team so far on turn one. Learning is the name of this game though, so it was good to take these lessons from this game. Turn three began with a succession of orders for the Soviet, sending the inexperienced infantry forward (-just- passing their morale due to the pin marker) as well as the left most infantry squad. These opened fire again on the German infantry, this time killing a number (5 or 6, I forget) and laying on the pin markers. I also moved the infantry squad near the centre of the field to the right infront the building – the second mistake I made with them. In response the Germans on the left flank tried to advance to return fire, but failed their morale and went down. Meanwhile the left flank went to town on the Soviet squad that had foolishly moved into the open. An advance order from the German infantry and likewise from the HQ (moving into a building) saw casualties as well as the two pin markers – not good news for the Soviets. Meanwhile the German sniper missed again. The Germans on the left flank managed to pass their morale this time and opened fire on the regular soviet infantry. Now, I forgot to take into account the (now) -2 for the pin markers. With the other modifiers in mind, they should have needed 5s (I think, might have been 6s), but I only accounted for the -1 for the range. This shooting resulted in four regular soviet infantry dying, when there probably should have been none. It probably didn’t have an impact in the end, but I’ll remember it for next time. Meanwhile the Soviet infantry on the left continued their advance and fire, taking the German squad down to four men. The Soviets on the left however were in a world of trouble, when German firereduced them to four men with three pin markers. They then failed their morale and went down, which saved them from further casualties (from the HQ I think?) but left them stuck in the open, ripe for an assault. 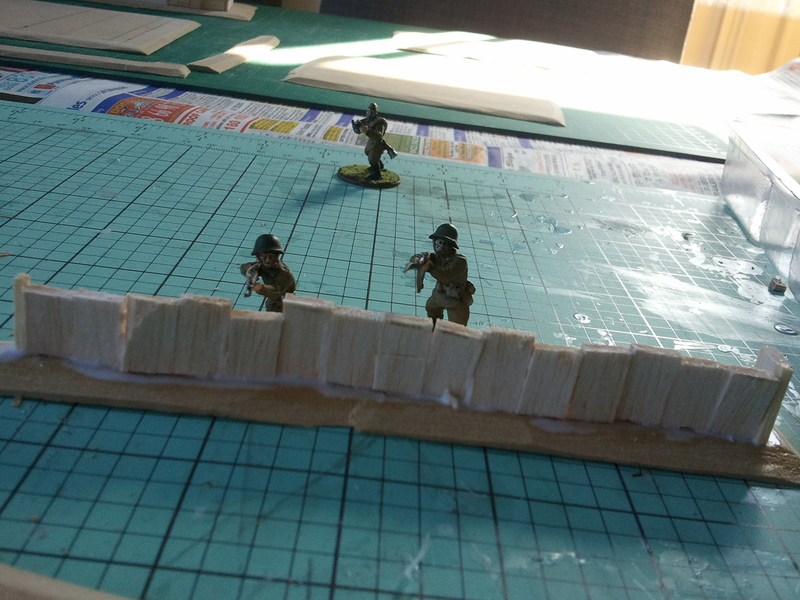 On the left, the Soviet infantry are stuck in the open and getting cut to pieces. On the right, the German flank is facing a serious Soviet problem. The turn of the assaults. 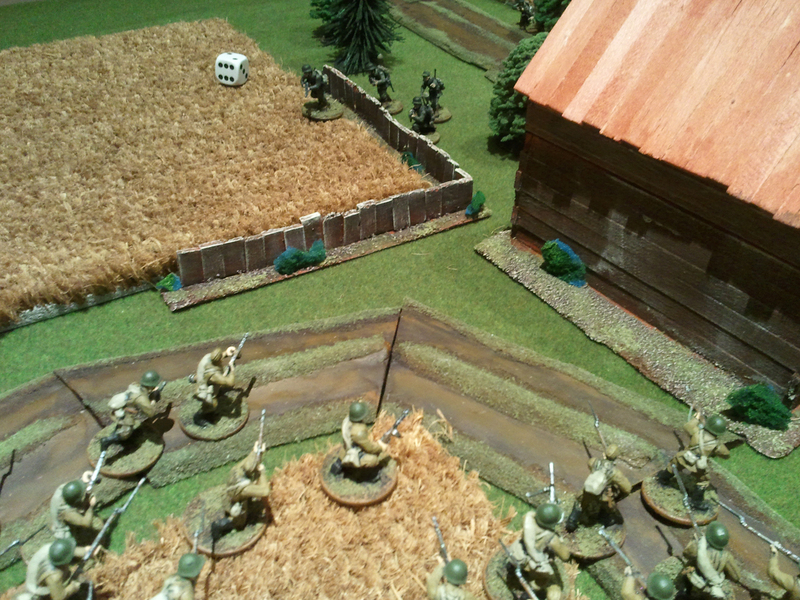 The inexperienced infantry got the jump and assaulted in through the gap between the barn and the fence. The pin markers meant the Germans failed to hit anything as the Soviets rushed in. In the close quarters fighting that followed, three Germans died, before the NCO took out a single conscript before falling. On the otherside, the German infantry assaulted the Soviets stuck in the open, who also couldn’t hit anything with the amount of pin they were contending with, and were quickly dispatched with no ability to strike back. 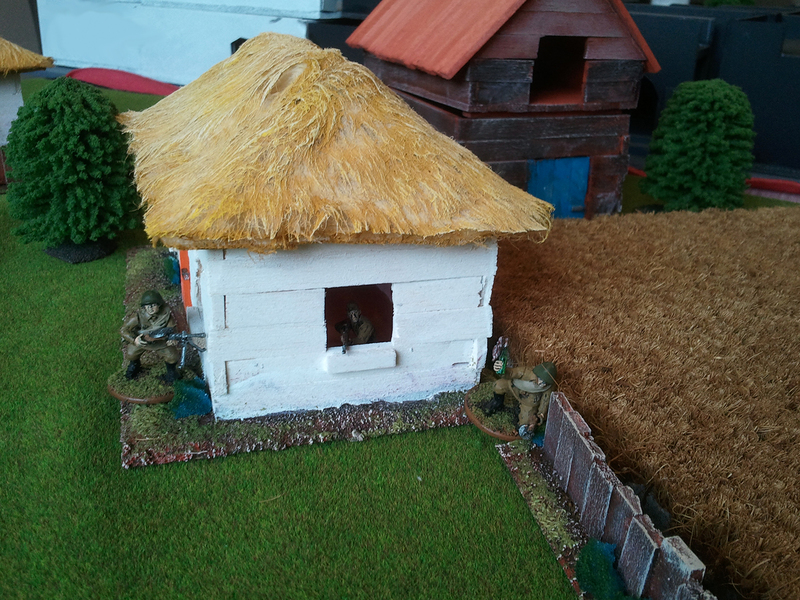 The German sniper picked off a conscript (finally hitting something), but the re-positioned HQ failed to hit. The Soviet HQ moved around the barn to open up on the German infantry squad, and did some damage, but this move was probably a mistake. 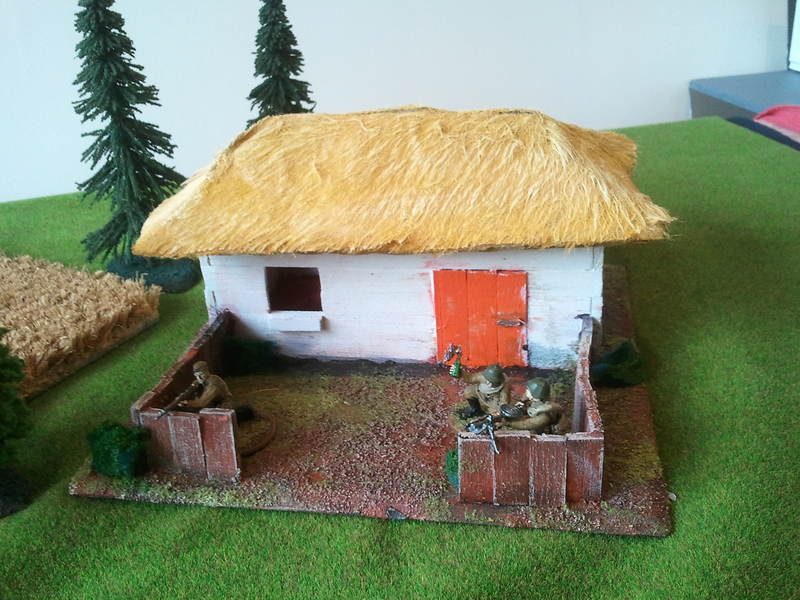 The surviving Soviet regulars moved behind the barn – being unable to shoot through their own unit (the command squad). 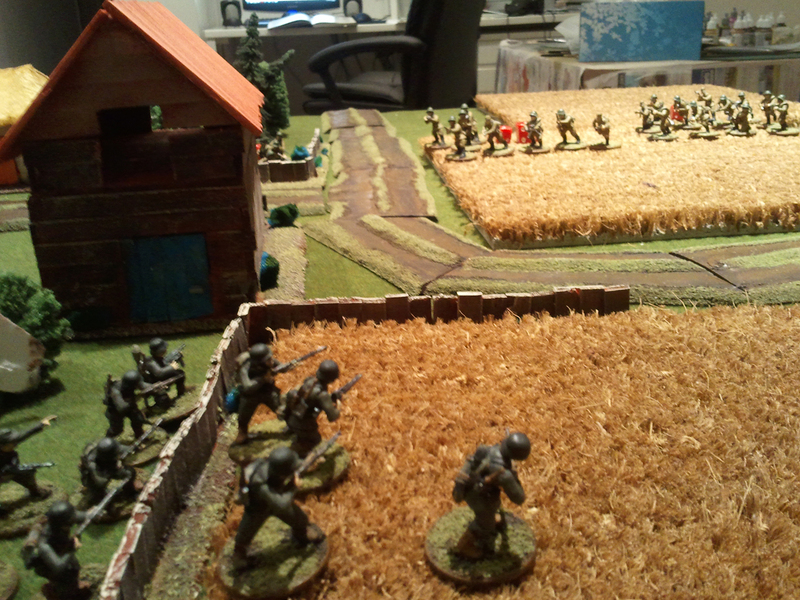 On the left, the Soviets push through the gap, on the right we have a shot of the field as of the end of turn 4 – the Soviet HQ is obscured by the barn. The inexperienced infantry rush the veteran sniper team. 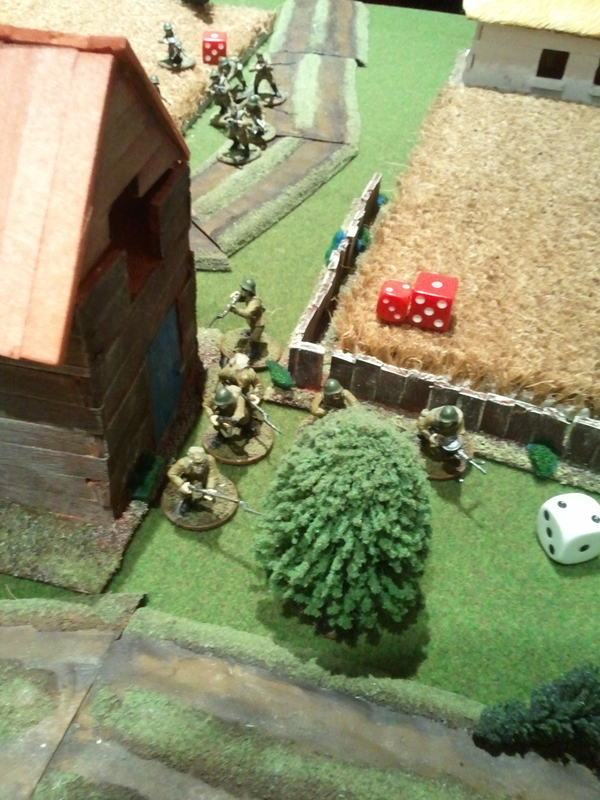 The greater experience of the Germans pays off, enabling them to kill two infantry before the sniper was overwhelmed. 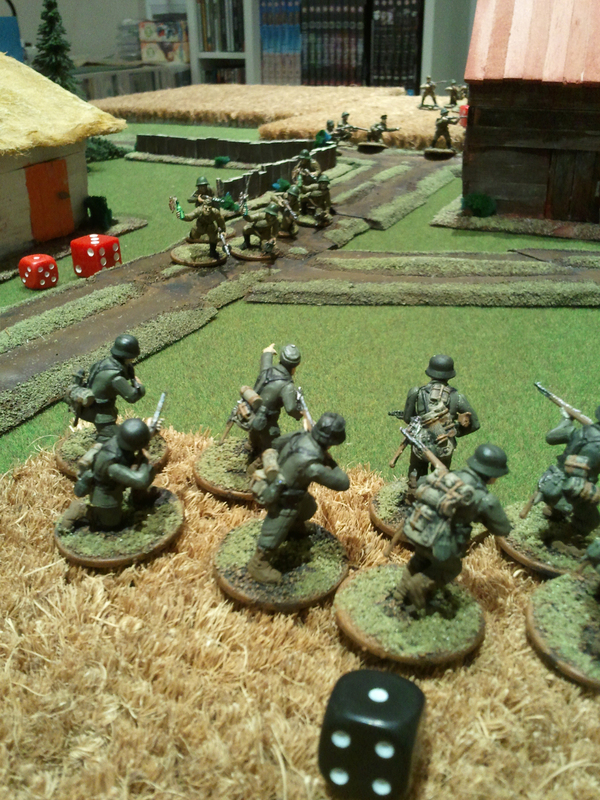 Meanwhile the German infantry assault the Soviet command squad and kill it with ease. 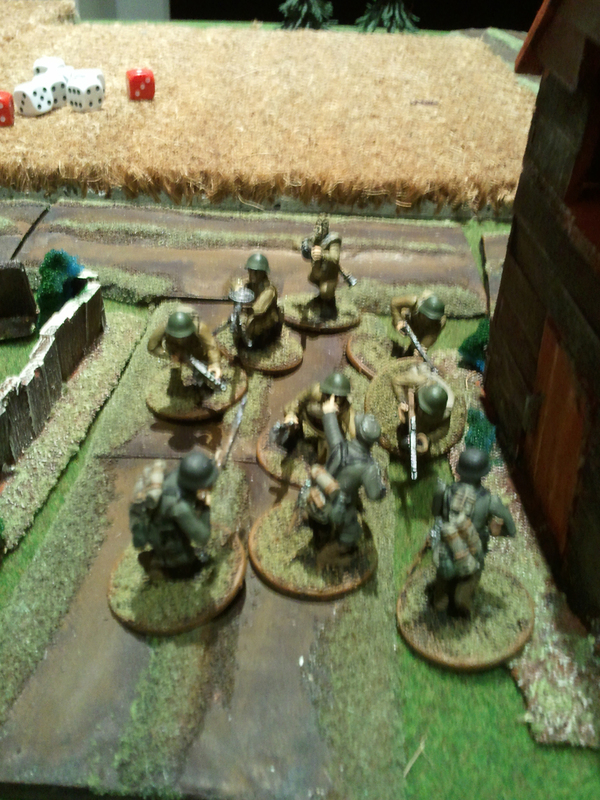 The German HQ exits the building to hunt the conscripts and kills one (or two?) despite their firepower (which should’ve made short work of the remaining men). The remaining Soviet regulars pop around the barn and open up on the Germans, but again the dice fail me and the Germans survive with only one or two losses. I roll and score a 5 – Turn 7 is on! 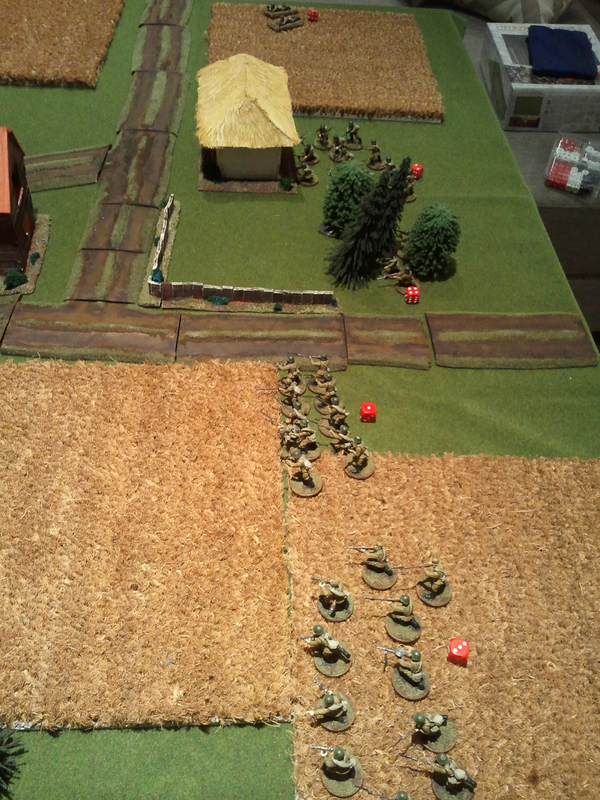 Currently the Soviets trail the Germans 2VPs to 3 – a draw. Soviets score the first order and I do a quick calculation and consider shooting the German infantry (rather than assaulting) would yield greater results. The dice had different ideas however. Despite scoring 10 hits from 12 shots, or something similar, only two Germans die, leaving two SMGs and an MG34 (actually, on review one of the squad members had taken a lie down in the front yard of one of the houses, so there should have been four men left – blind wargaming, that’s what it is all about, people!). With only two men left following withering point blank German fire, the remaining two men fail their morale and are Destroyed. 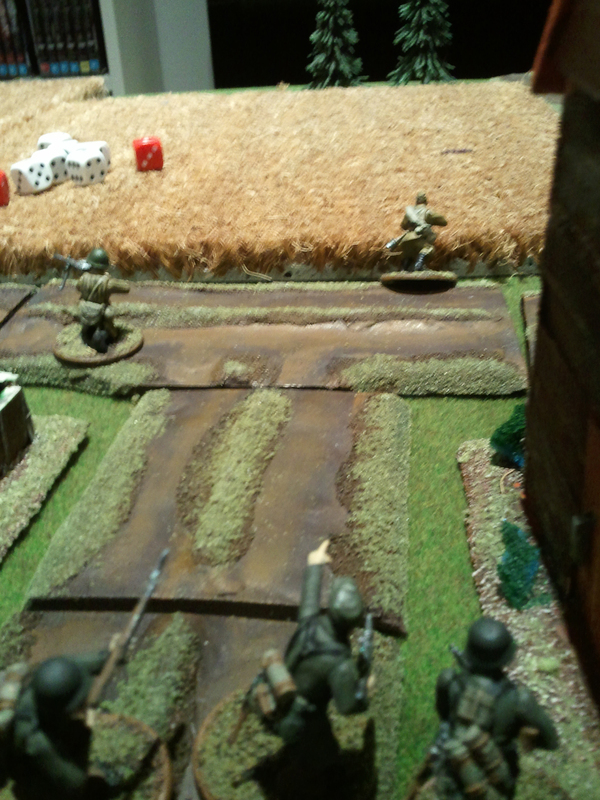 Meanwhile the German HQ mopped up the inexperienced infantry with ease. The end result: Soviet 2VPS to German 5 VPs. Victory to the Germans! Well I had good fun playing against myself. The battle ebbed and flowed just as one always hope battles will. I made some poor choices though and those tactical errors ultimately led to the Soviet loss. The first two were with the Soviet infantry on the right, who should have hung right to cover the sniper (or the now dead sniper, which should have been set to ambush) and I should have let the other infantry move up to face the Germans after their comrades were destroyed, rather than putting the HQ in their path first. Still, either way I ultimately won, because I was playing both sides! Hope you enjoyed this first (though small) AAR! I almost certainly won’t be able to do much hobby work this weekend, but a FoW game should be played either tomorrow or Sunday and I’ll have the AAR for that up ASAP after that! Till then, happy wargaming! 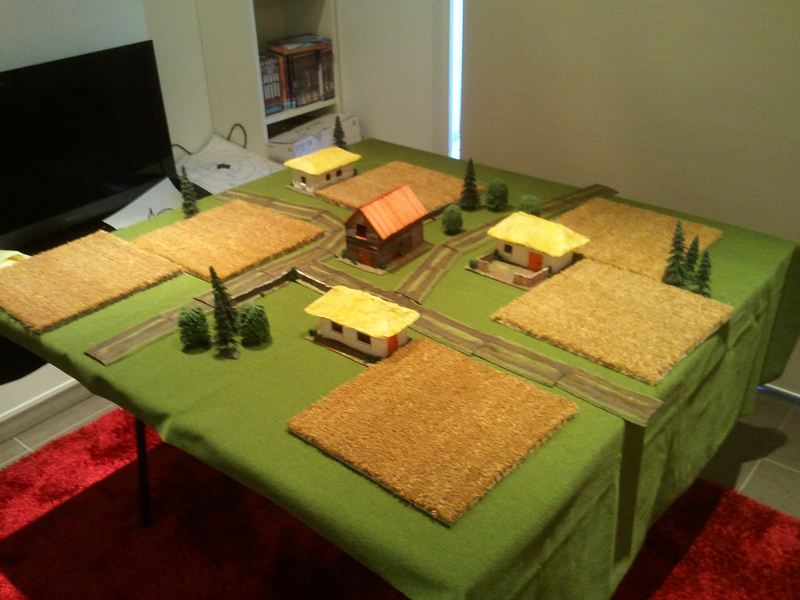 Yesterday (Monday, 13th of October) I finished my farming commune, the first of my scenery for Bolt Action. Suss my previous posts regarding when I kicked things off on the long weekend and my trial and error with doing the rooves last week. I’m very pleased to have it completed and I’ve learnt a few things along the way which should improve things in the future. The farming commune consists of three houses, a barn and four fence sections which join together in pairs of two at 90 degree angles. 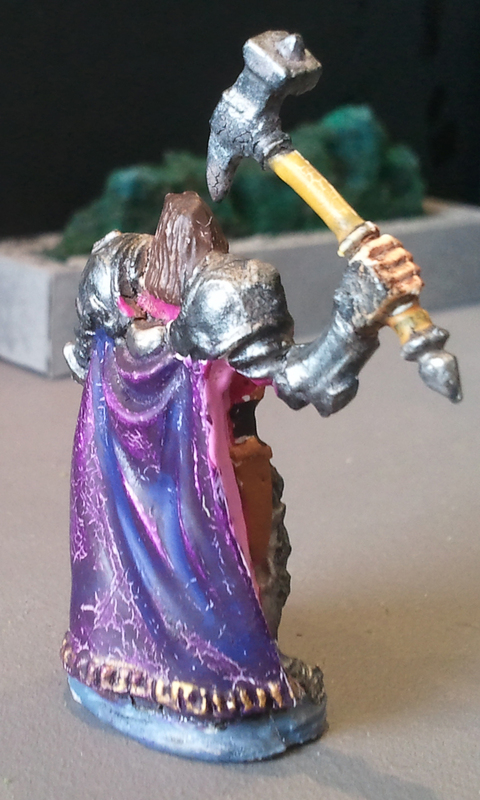 Nothing fancy with the paint jobs, for the most part I’ve used craft paints from Spotlight (about $3 a tube). I started on the bases for each piece with a watered down coat of a colour called Brown Oxide and when this has dried thoroughly, drybrushed over that with Red Oxide. The houses are white, with orange doors (the handles are Gunmetal Grey). The rooves were painted Yellow Oxide, then drybrushed Cool Yellow and then a lighter drybursh of Unbleach Titanium (a Sonja’s colour, I also did a light dry brush of the bases with it after the red oxide). I didn’t photograph and document the whole process, but the rooves themselves are folded cardboard with fake fur glued on. The fur is then heavyily coated with watered down PVA glue, stroking the fur down from the top to the bottom of the roof. Finally, the fences and barn were originally done Red Oxide, but I changed my mind and did them Brown Oxide and then dryburshed with Unbleach Titanium. One of the barn doors is also Magic Blue, Red Orchestra eat your heart out. After the paint had dried I did a good coat of burnt grass flock (I think that’s the right name of it, I think it is Woodland Scenics? Not sure, I do have another bag, might check the label some time). I then applied smaller patches of a flock/static grass called Meadow Grass, I’m no idea of the brand, I bought a big packet of it about a decade ago which has long since been thrown out. I then sealed this all with a healthy coat of watered down PVA. Finally, I tore up bits of foam that had come from plucking the various sheets for my KR Multicase and glued these down as small bushes/shrubs/tufts of green. The foam is actual blue, but I gave it a good coat of watered down Dark Green before dry brushing with Camo Green. Over the course of the project I’ve identified some improvements for the future. Firstly, when assembling builds, in the future I will cut my lengths for each wall section (i.e. 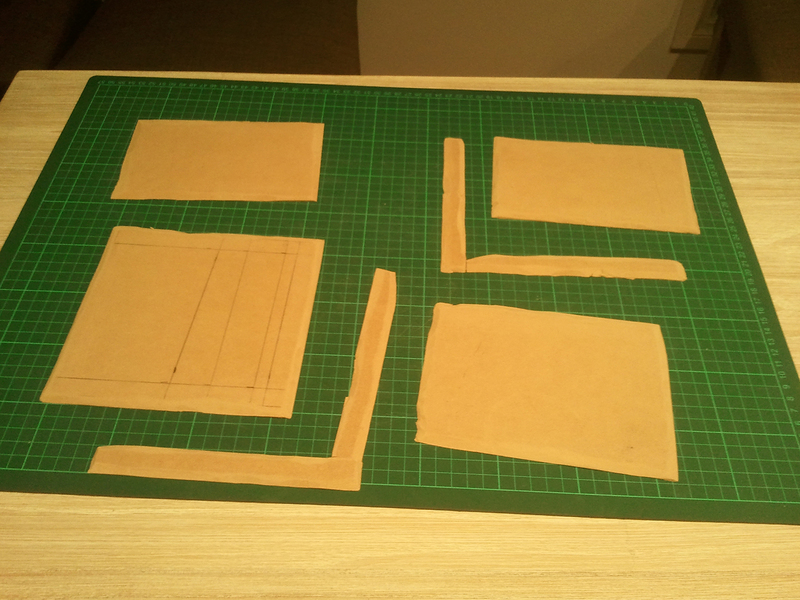 all the bits needed to form the front wall, the back wall etc) and then glue these together in a sort of sheet. I’ll then cut the ends to create the overlap (so each wall will have alternating long and short rows), cut out the door/windows required on that wall, then once all the separate walls are sufficiently dry, erect them like some sort of pre-fabricated structure. I think this will result in smoother walls that will be easier to ensure stay square. The second thing will be to remember fake fur has a grain. I remember now that I noticed this when I made my Eastern Front terrain for FoW. The rooves would look better if I made sure the grain of the fake fur always flows from the top to the bottom of the roof. Finally, there is a bit of a gap between the upper/roof part of the barn and the first floor. I didn’t notice this when I assembled it, but it is quite noticeable at some angles. I’ll be more careful in the future to avoid this. The pre-fab building method is likely to help. 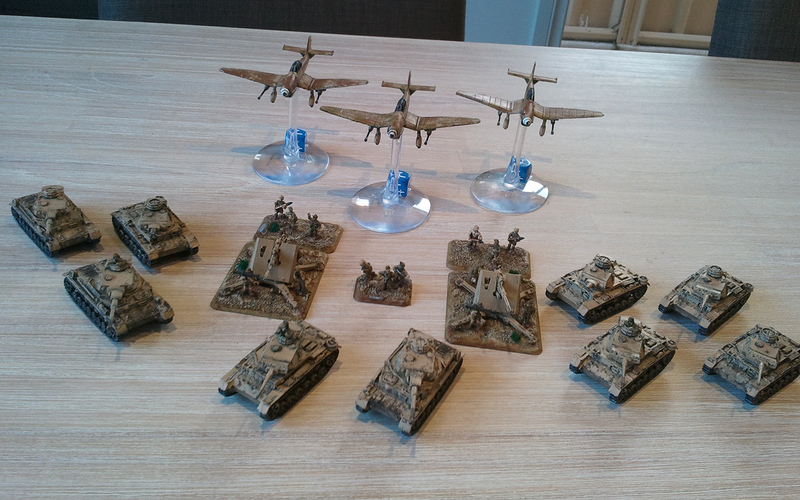 Overall I am quite happy with the result and pleased to have my first pieces of Bolt Action terrain done. 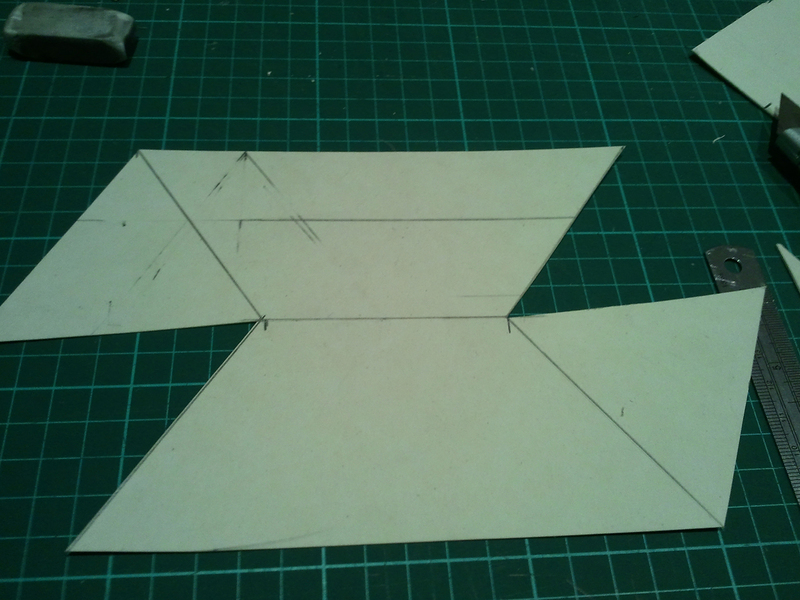 What I’ve done so far can probably fit fairly comfortably across up to half a standard 1800mmx1200mm (6’x4′) table. As it is displayed on my kitchen table, it is taking up about 1000mmx700mm (3.1’x2.4′, or there abouts). But I could lay down more fields (which I would do) and increase the coverage. I think the main thing it shows is how much I need to get my 1800mmx1200mm board up from mum and dad’s – 1000mm wide is doable for FoW (my kitchen table is 1000mmx2000mm), but it’s a bit restrictive for 28mm games. Course I do have two 1200mm square boards (one of which you can see in the background of one or two of the images about with my Infinity terrain on it) so I could always put them side by side. I’m not sure what to work on next terrainwise for Bolt Action. I think one of the things that make what I have done so far look a bit weird is the lack of roads. I don’t own any 28mm WWII vehicles though, so I’m not sure what dimensions they should be. A simple next task would be fields. I cut up another doormat for the photos, but it is only 10mm high – fine for FoW (which is what I originally bought it and one other for) but too short for Bolt Action. Bunnings do a 28mm thick mat though, so I might investigate that this weekend or next ($42 though, not cheap). Other than those two things: hills and forests. 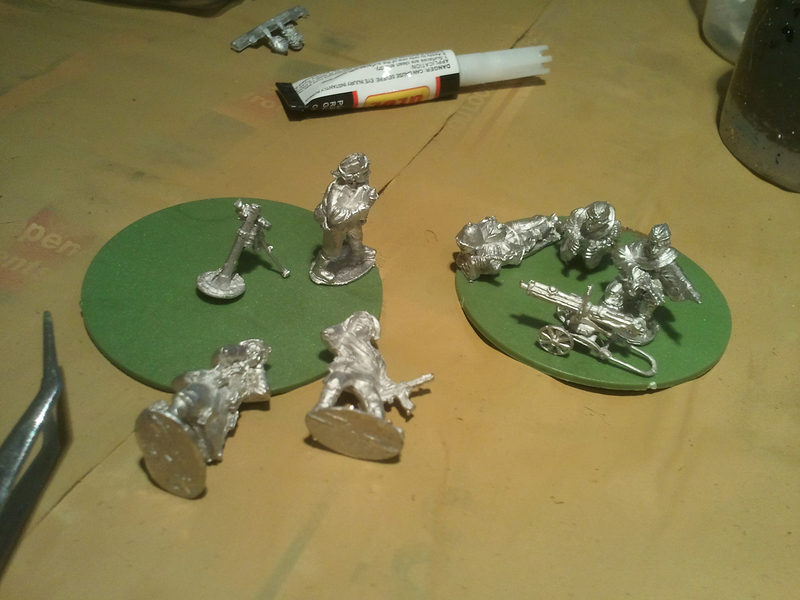 The trees I have are much better in size for FoW, but still useable for 28mm wargames, though they look a little odd. But I need new forest bases (mine being shoddy foamcore knockups – you learn the hardway not to paint foamcoare if used as a basing material). As for hills, I currently have none, but do have the foam for it now. All that considered, I’m thinking roads next. But there is plenty to compete for the attention: North Africa terrain for FoW; more Infinity terrain; and painting miniatures (though I’m short on those at the moment, deliberately so). That’s all for now though, things are looking good for a game of FoW on the weekend so I am hoping that will be this weekend’s post! 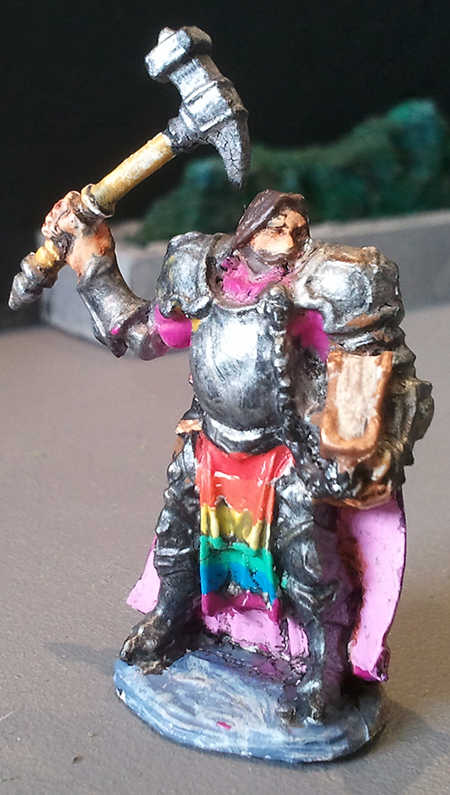 Till later, happy wargaming! Well, I had very much hoped I would be posting about the imminent painting of my farming commune to take place on the weekend. Unfortunately I’ve been slow getting the rooves for the houses together. I’ve gone through a process of trial and error, trying to do something fancy and ultimately failed. Moral of the story: KISS! (That’s Keep it Simple, Stupid!). 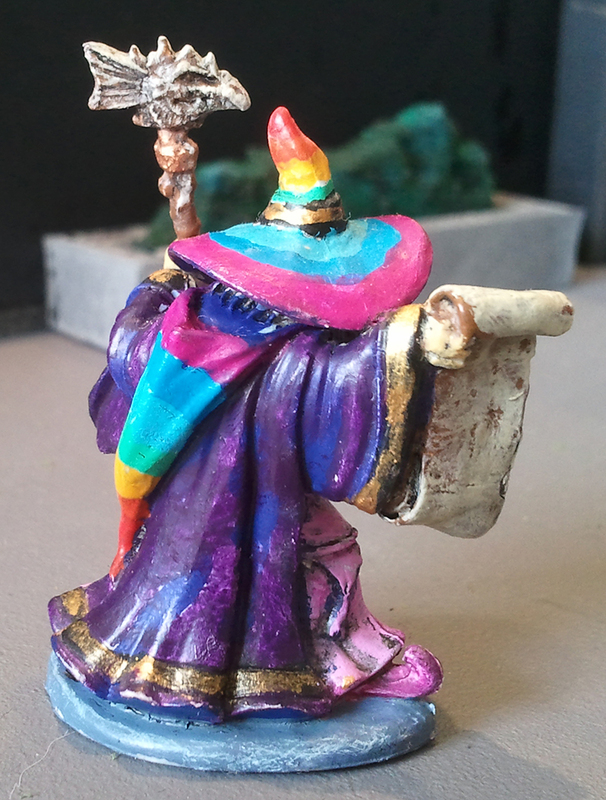 The other thing I hoped to achieve this week, painting the last character for our current Pathfinder game (mine, actually, a human cleric) is also not done – though I am close. So that is something to look forward to next week (or maybe the weekend). The rooves for the houses of the farming commune have been Frustrating. I wanted to try something fancy, hot on the tail of my pleasing outcome with the barn roof. 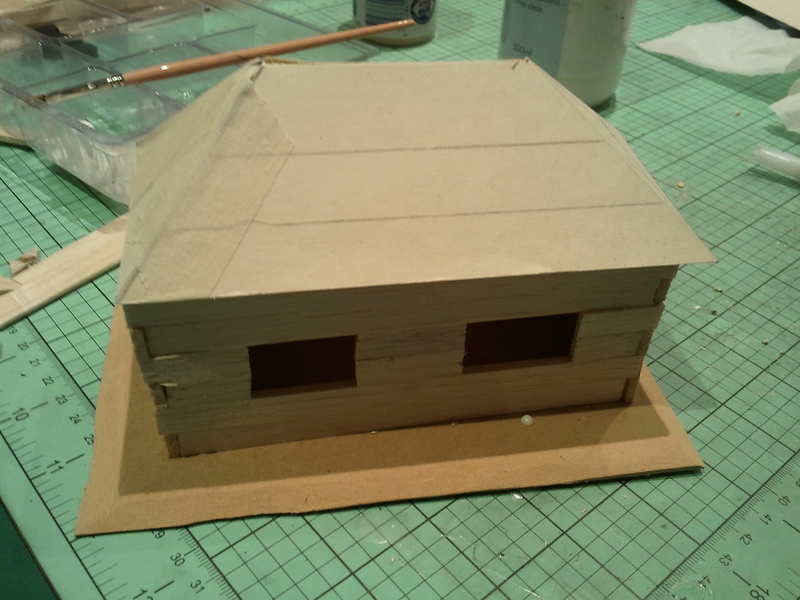 What I wanted to do was to cut roof beams that would slot onto the walls of the buildings and onto which I would glue thick card for the fake fur (for the thatch) to be glued to. I cut six roof beams per house: at one end they had a 45 degree cut, and at the other two 45 degree cuts to form a 90 degree cut out which would slot onto the walls. These were then glued together with beams facing each other and the third coming off perpendicular to the centre of these – as per the image above. Gluing these together was Annoying because I have a bad case of the Can’t Cut Straight to Save My Life disease. I suspect this comes from my hand eye coordination (or lack thereof), a result of my being legally blind. Given this is, after all, an underlying (though no doubt uncommonly mentioned) theme of this blog, I will chalk it up as a Challenge for the blind wargamer. The next step would be to glue a couple of slats along the beams, joining the two separate sets of three together. 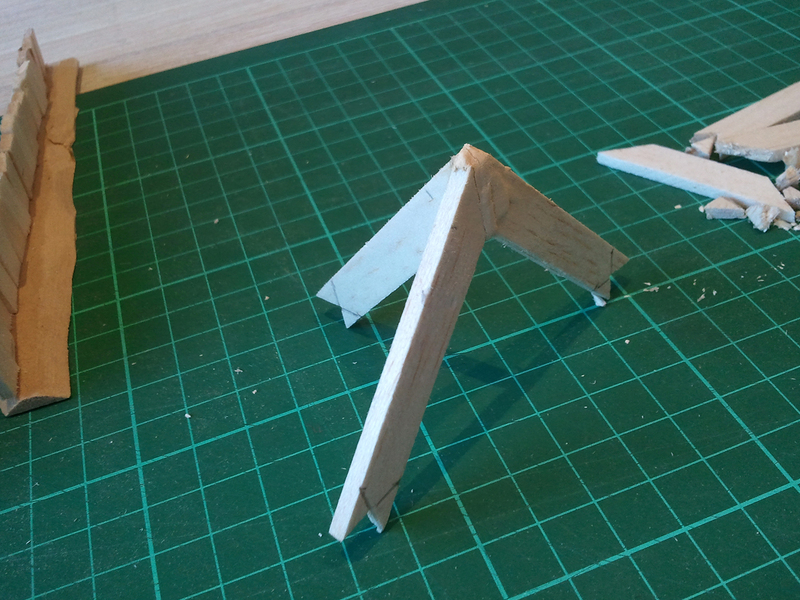 These beams were cut at 45 degree angles at the ends and would be arranged for card to be glued over the top, or foam core to be glued between – I hadn’t fully decided. I never did glue a second set of beams on, as you can see from the above image. Yeah. I think it speaks for itself. It wouldn’t sit right, I wasn’t happy with how it was looking. Cluck it. Time to KISS. 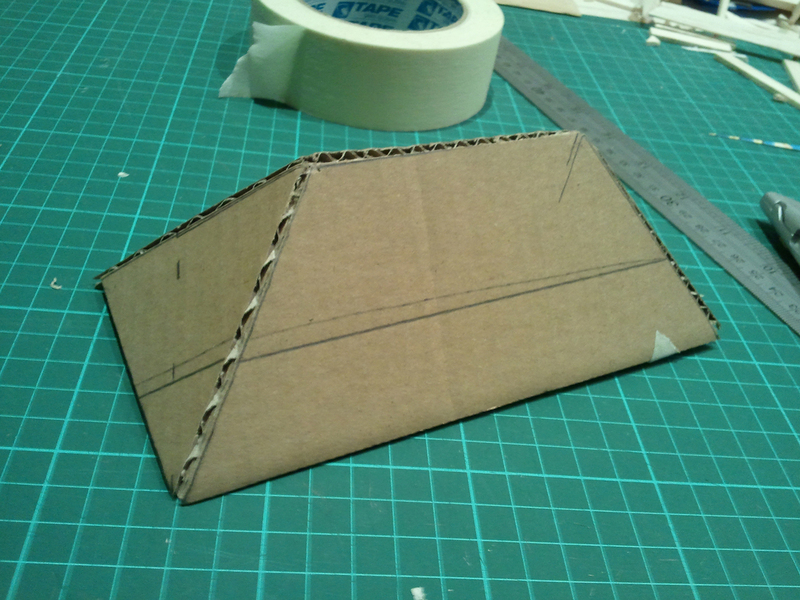 So I decided to go back to the tried and true method: draw up the roof on card, cut it out, fold it up, sit it on top the walls unaided. 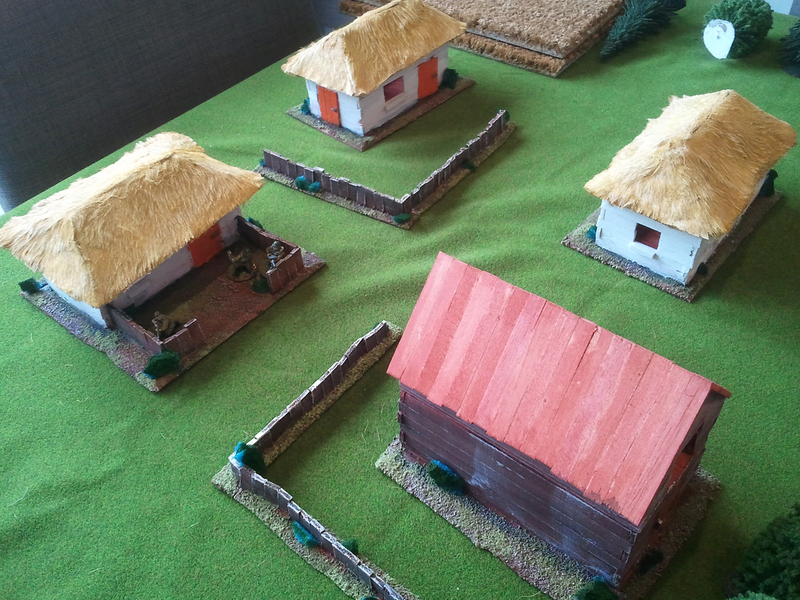 Just like I had done with my Eastern Fronts houses for Flames of War (these will appear in more than one FoW AAR in the future, I know this for certainty). I was armed with the power of greater knowledge in that I knew to be successfully there had to be some degree of overhang. What do you know, it worked out great! 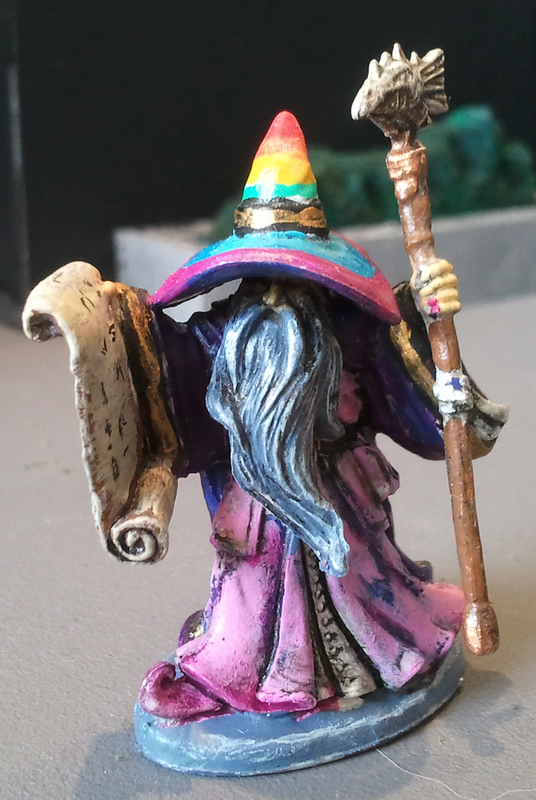 I’m still playing around with the roof pitch through trial and error, but have go to the point where I am resorting to Mathematics and will have things done tomorrow morning – tonight being given over to Friday Night Magic with a mate. I still hope to have things painted on Sunday, a very reasonable aim given my clear weekend (bar the usual chores). The long weekend drought has officially ended with Labour Day bringing the deluge of weekend that we’ve all be craving! With my DAK painted up and ready for battle I set my sights on getting stuck in to making the terrain they’d be fighting over. Of course this did not occur. 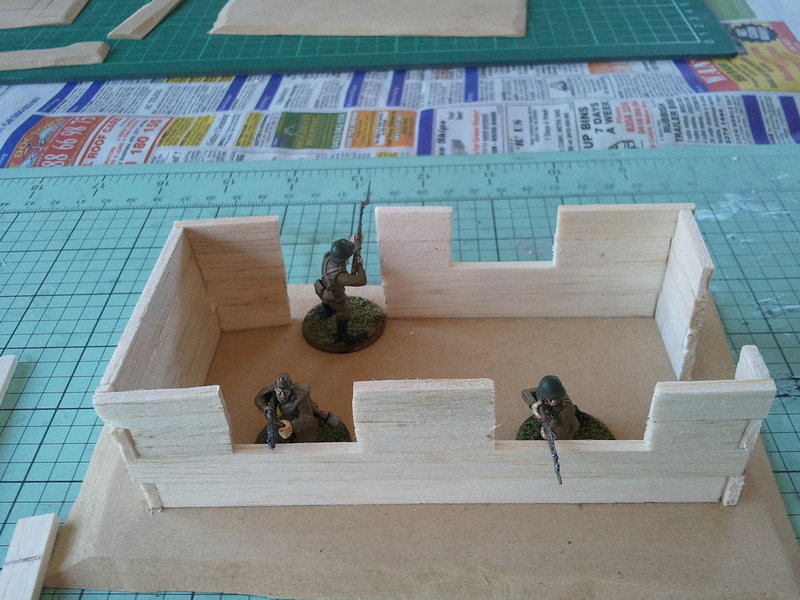 Instead I focused my energies on kicking off my Bolt Action terrain! I had been considering doing terrain squares for my FoW North Africa board – an idea that was unfortunately scuttled via the prohibitive cost. Instead I settled on doing the usual: get a large MDF board, do stuff with that, making fully interchangeable terrain for a different battlefield every time. Problem: large MDF boards are large. One of the challenges of being blind is that you can’t drive. This can be Annoying at times. Although I can get to the nearest major shopping centre (including Bunnings) within 10minutes thanks to the train, lugging an 1800mm x 1200mm MDF board around isn’t very desirable. Although I did conscript my parents for taxi duty, their Nissan X-trail has just a fraction too little space to fit said board. And besides, they came up in dad’s work car (a sedan) instead. So most of Saturday ended up being driving around buying things. Lots of things. Brushes, foamcore, balsa wood, MDF (3mm sheets for basing terrain), paint and extruded polystyrene (from Bunnings, Bunnings is the best) and more besides. 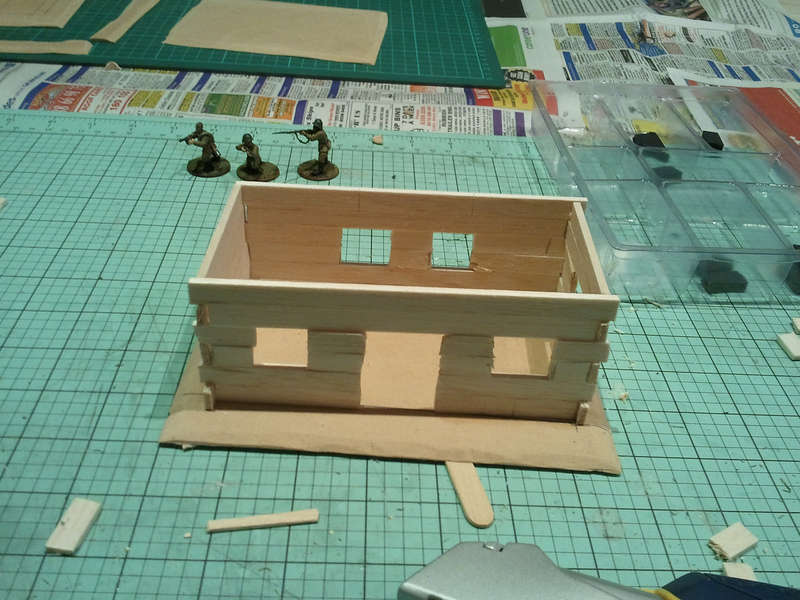 Back at home I decided to get to work with the balsa wood (I buy the Balsa Basics – Balsa Sticks packs, $13.95 for I have no idea how many 150mm x 9mm 3mm thick sticks) and get started on my Eastern Front Bolt Action terrain. As usual my plan is in my head, but the basic idea is that I want a farming commune, fields, forests, hills and a railway line in the fully interchangeable fashion to make my 28mm Eastern Front battlefield. This follows exactly what I have for my Flames of War battlefield – with the addition of hills which are entirely lacking from my scenery collection at the moment. I decided to start with the buildings for the farming commune because I already have forests (though not very good), don’t want to start with the hills and don’t have what I need for a rail line. For the commune I decided starting out with a few buildings (say two or three houses and a barn) plus some fence sections should see me in good stead. 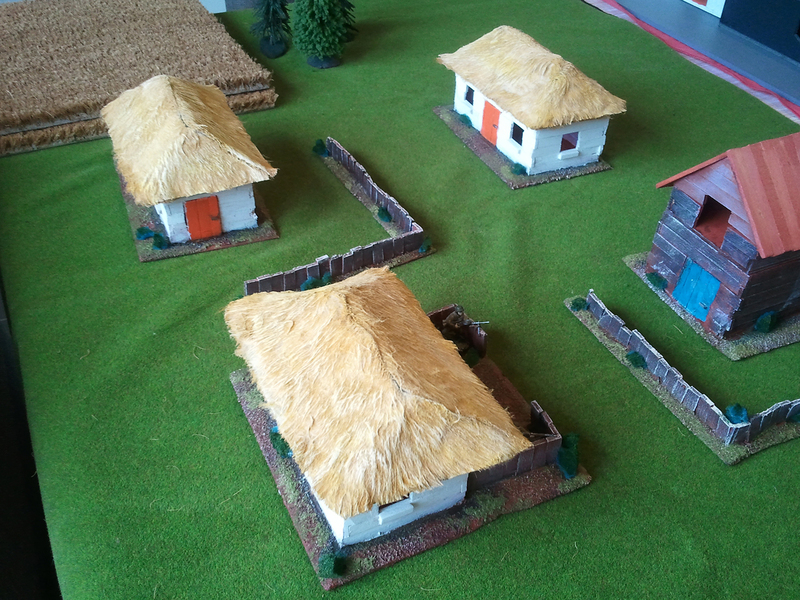 I decided to follow the style of my FoW buildings for the design – these will appear on my blog at a later date in AARs. Basically they’re a rectangular shaped building made of balsa wood with some empty spots for windows, a door and a removeable thatched straw roof. The buildings themselves are painted white. Saturday afternoon I only got a little bit of work in as I was going out for tea, then on Sunday I spent three hours Outside doing some “gardening”. Turning my kitchen table into a workbench (it usually is), I spent the rest of Sunday and all of Monday (9-6) I was making terrain. I’m very pleased with how thingsa re going so far – images below. 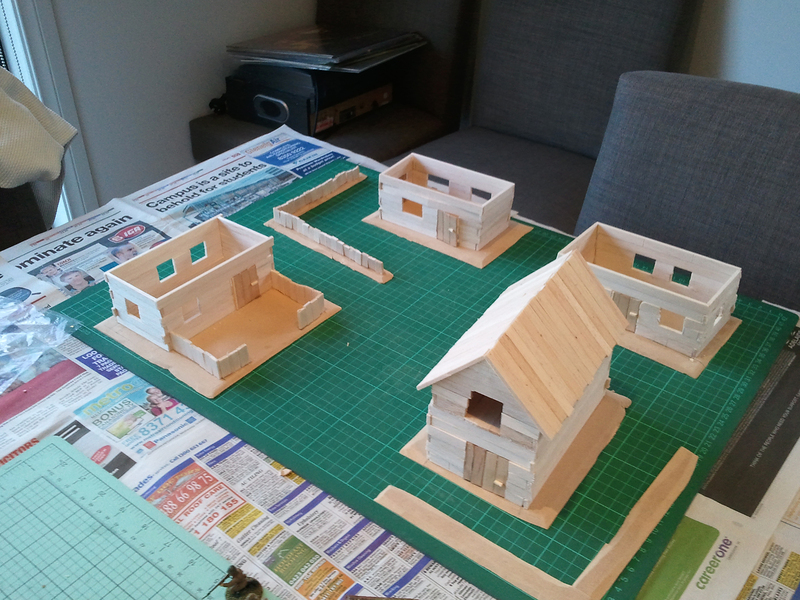 I cut up some 3mm MDF bases and ended up with three for houses (two rectangular bases, one square – this was a mistake, but as with all mistakes I make when making wargaming things, I just rolled with it), one for a barn and four for fence sections. I ended up finishing all the buildings and two out of four fence sections. 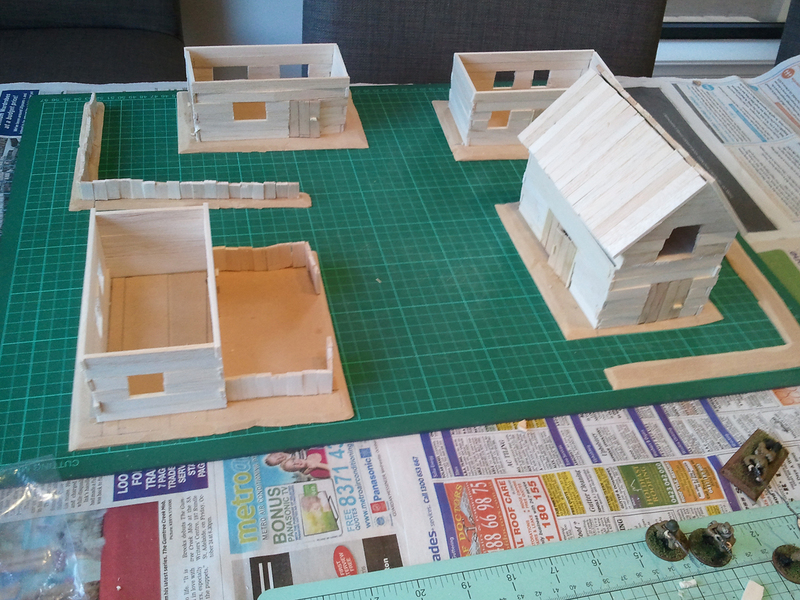 I’m yet to do the rooves for the houses though, something I’ll do this week after work, although with sanding the bases. I hope to be painting next weekend and if we’re lucky, finishing the set, at which point I will cut up the spare door mat I have and set it all up to marvel at my creation. The bases, the back two were for houses, front left for another house with a fence around it or a shed or something and the front right for the barn. The thing ones are for the fences. I hope I didn’t need to point that out. Partway through the construction of building one and the brave Soviets defend the work site. Same shot as above, but from a higher angle. 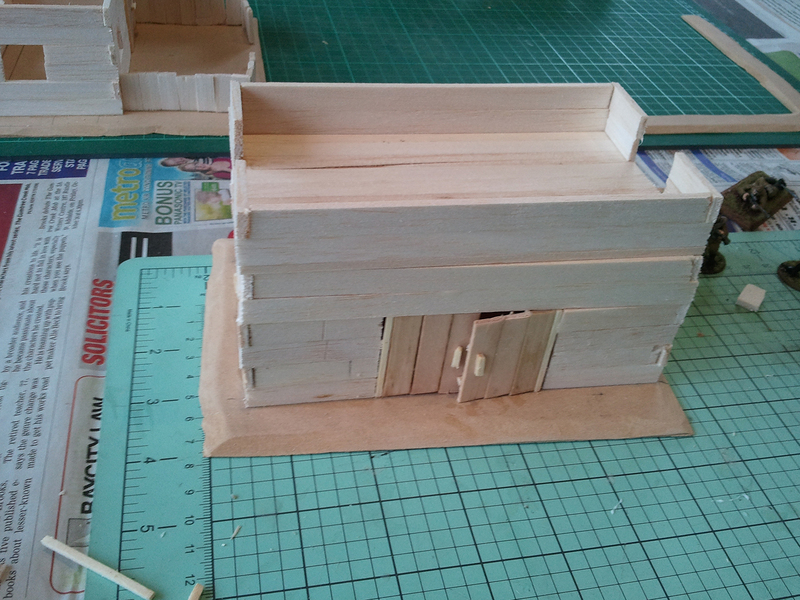 I stuffed this build up a bit, the wall in the left of the picture is about 5mm shorter than the one on the right. Not sure how that occurred, but we’ll live with it. Might make the roof a bit funny. The internal dimensions were supposed to be 80mm x 130mm. The doorway is 30mm wide, as are the windows on this building. The idea is that each house should be able to fight a unit or MG or other weapon team inside. The first house with doors fitted. The first fence section, our brave comrades are at the ready once more. The second house less its door. 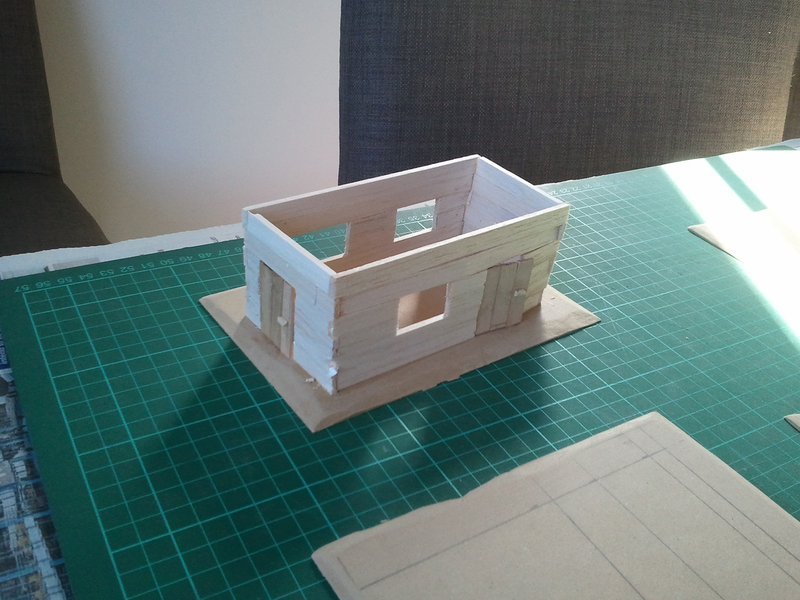 I decided to change the window size to 20mm wide for this (and the third) house. I think it looks better. 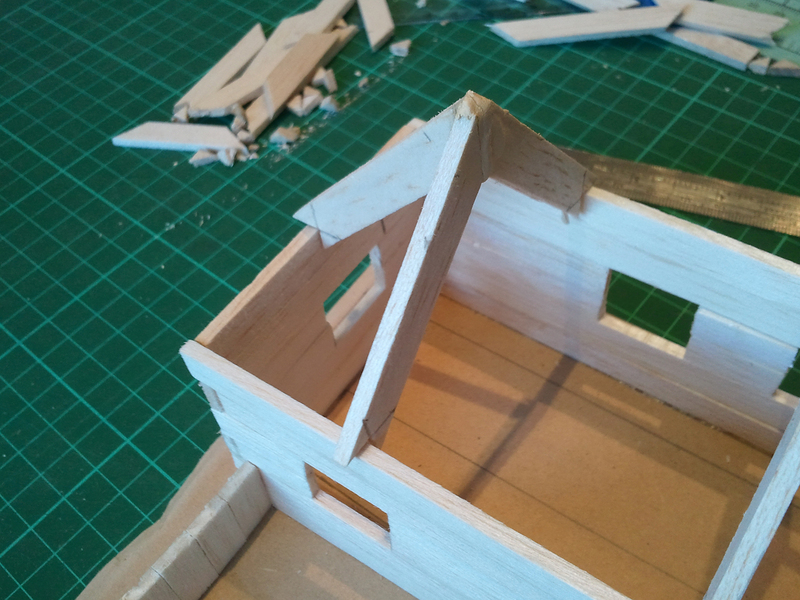 This house is also slightly larger, I think the internal dimensions are 70mm x 140mm. The barn, less its roof. The top section is separate from the bottom. I placed two bits of balsa on the underside of the loft so that they site inside the ground floor, so that the loft can’t be knocked off. They don’t fit completely snug, but that was intentional so that things didn’t become too snug when the building was painted. There are doors on three sides to the barn: left and right of image; as well as the large double door. The barn roof. 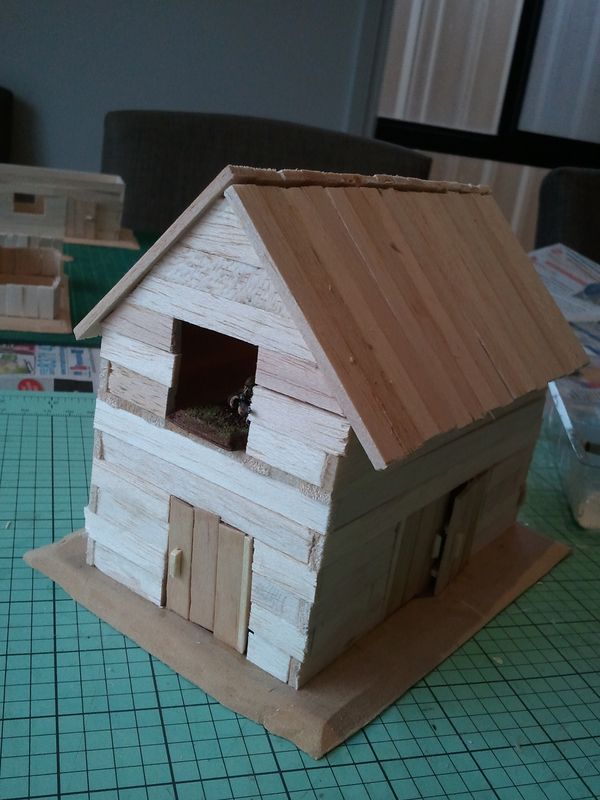 For my FoW barns the removable roof is just the slats section. 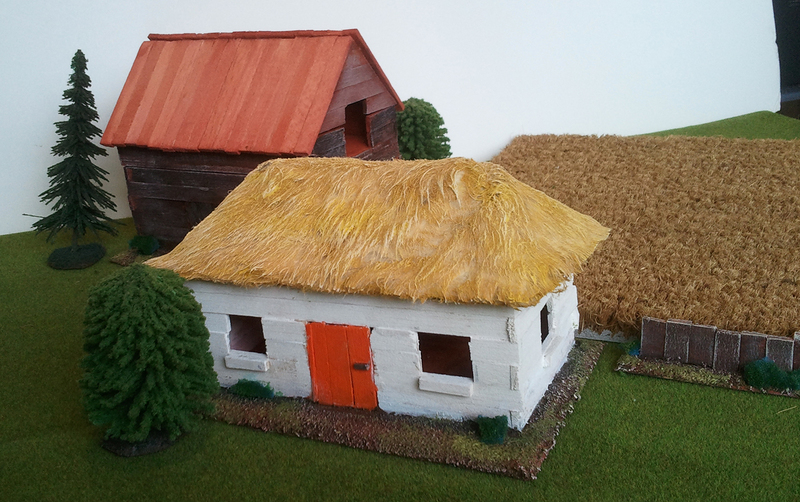 I was going to do this, but changed my mind because I’ve never been too happy with how the rooves fit for my FoW barns. 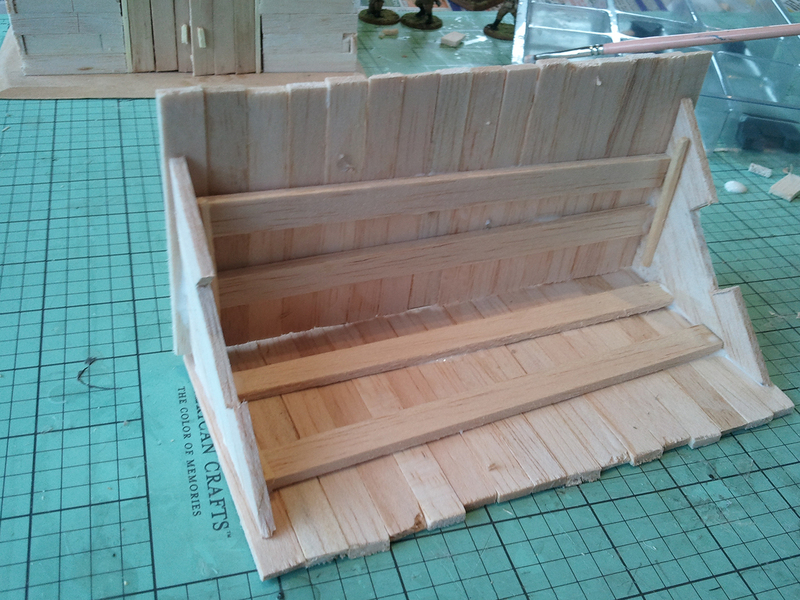 Instead I made it so the top section of the loft would be removable, leaving two rows of balsa (as seen in the image above) so that things still looked “right” if the roof was left off during gaming (two rows is perfect barrier height). To make the A frame I glued together my sticks, then did the magic with the protractor to mark 45 degree slopes, because drawing these in and cutting the excess wood off, leaving me with triangle wall sections. Next I found through trial and error the best thing to do was to cut and glue all my slats together, then back these with two balsa sticks, making sur the slats overhung the sticks by a small margin. Finally I glued the completed slate sections to the triangle walls. Another shot of the completed barn. A very sneaky Soviet has made his way in to pick off the facists already! 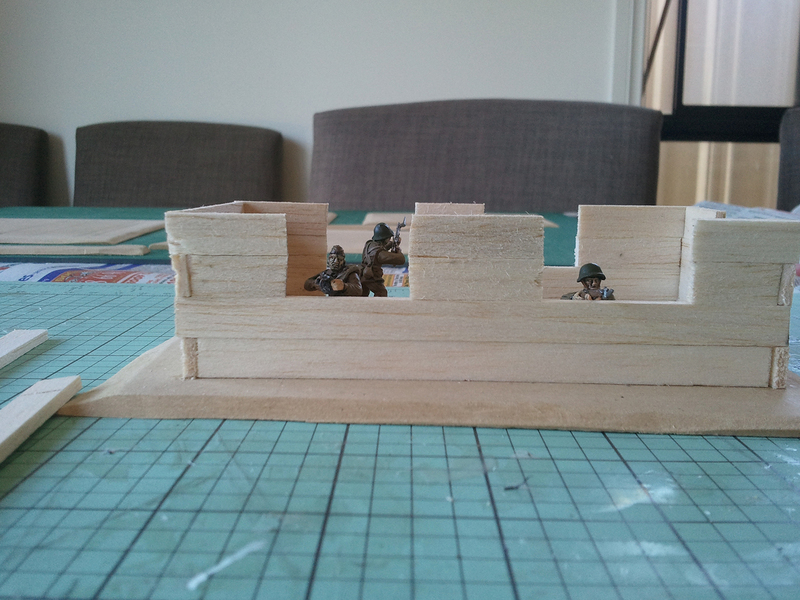 The loft is high enough for standing models, but the idea is for it to mainly be used as a sniper or machine gun nest. The farming commune so far. I forgot to take pictures of the house on the square base, but basically it has internal dimensions of 80mm x 130mm with 20mm wide windows. I ended up going with just a some fencing out the front. Perhaps it would have been better with an additional door on the other side, making it the front, then fully enclosing the rear area in for a garden, but I’m still happy with it. 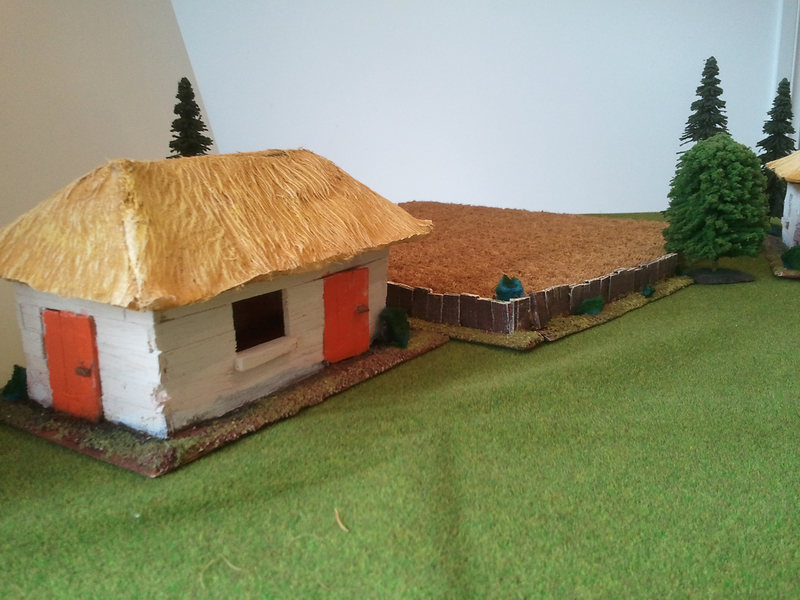 I still need to do the other two fence sections, then I will do the rooves for the houses, then sand the bases. Next weekend I hope to be painting these up ready for combat. 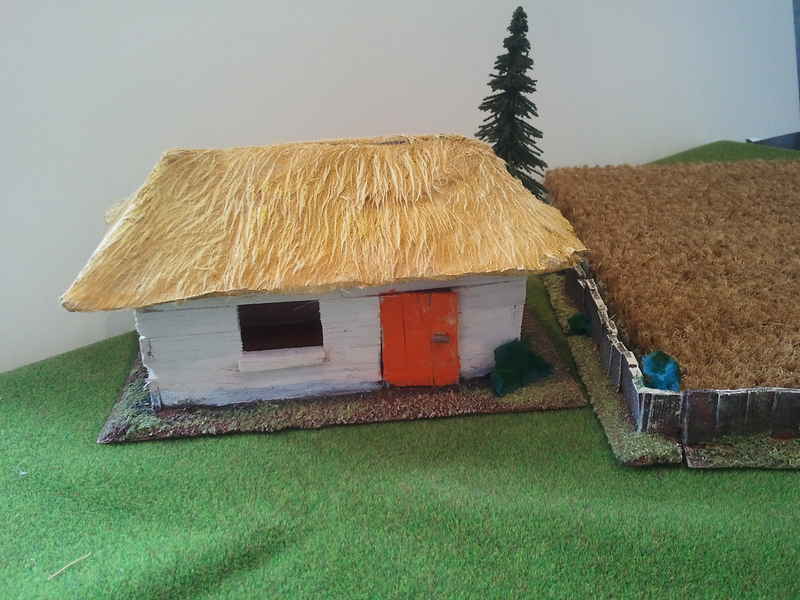 Another shot of the farming commune as it stands so far. I’m very pleased with my progress and am really looking for ward to getting these done so I can give Bolt Action a whirl. A highly productive and fun long weekend! I had intended that the last quarter of this year would be dedicated to Bolt Action once I my Infinity forces and terrain at a playable place. This intention was unfulfilled, however, as the result of my long awaited Stuka Ju87 dive bombers for my Deutsche Afrika Korp (DAK) finally arriving. This was followed a couple of weeks later by the arrival of the DAK Flak 88s I was waiting on. 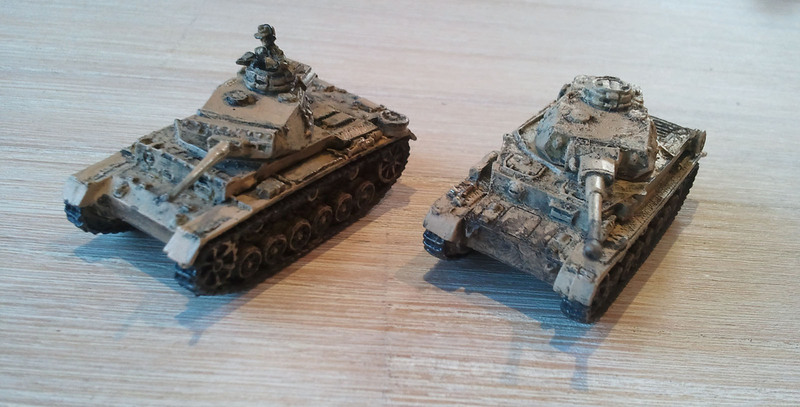 I’ve still got another two Panzer III L/Ns on order, but to work around the niggling issue of not having a properly organised force, I requisitioned three Panzer IV F2s that I had intended for my Hungarian mid war forces. My aim was to spend an hour or so after work each day painting with a larger block dedicated to the task on Saturdays and Sundays and I was very pleased to exceed this aim. In the first week of the month I knocked off my second Panzer III platoon (the first had been done a while back) which includes two Panzer III Ls and a single Panzer III N (none of my panzer platoons are full strength at this stage, mate and I are doing a slow force build up thing), Week two involved assembling and getting my Stukas and 88s ready for undercoating and painting, my Panzer IVs were already at that point. 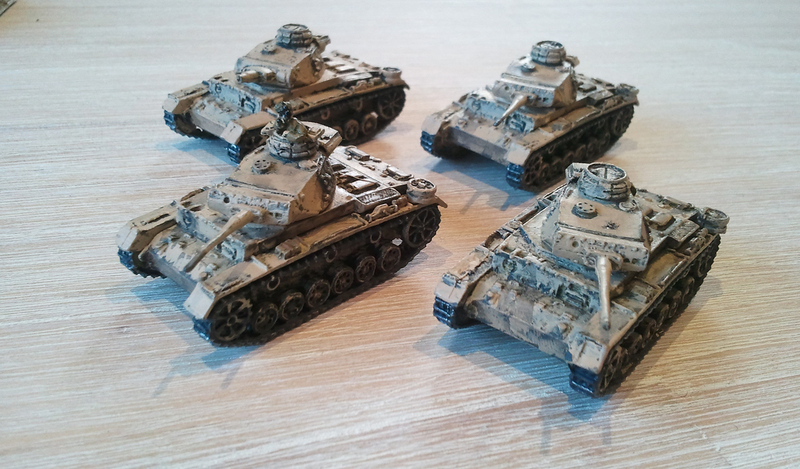 After undercoating on the weekend, week three involved painting my Panzer IVs (three PIV F2s), followed by my Stukas on the following weekend. Finally, I painted and based the 88s in week four. 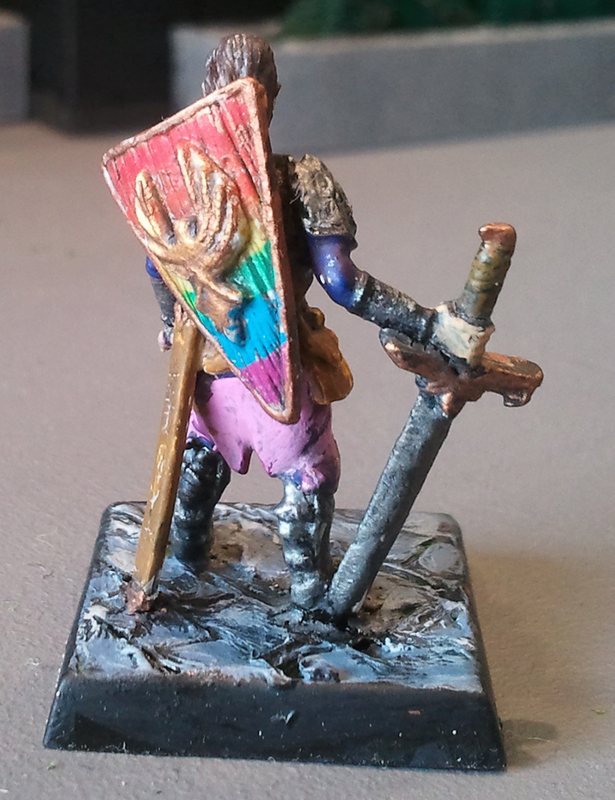 My colour scheme doesn’t adhere to historical accuracy very well (to the best of my knowledge). 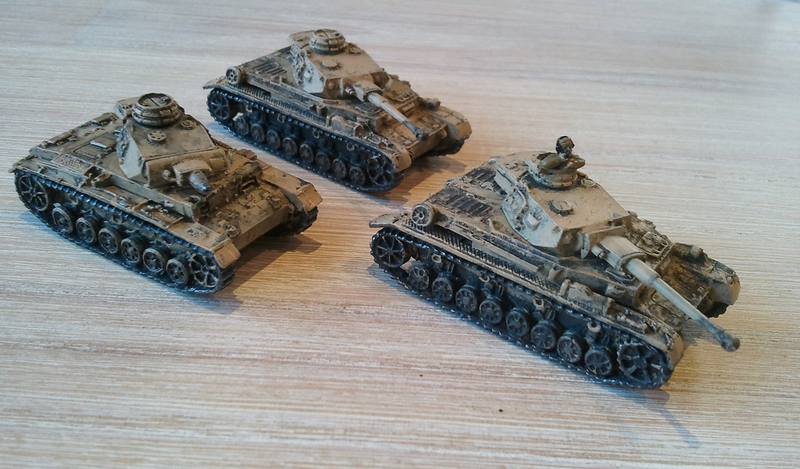 My panzers are Iraqi Sand, with German Grey tracks that are then drybrushed Gunmetal Grey. 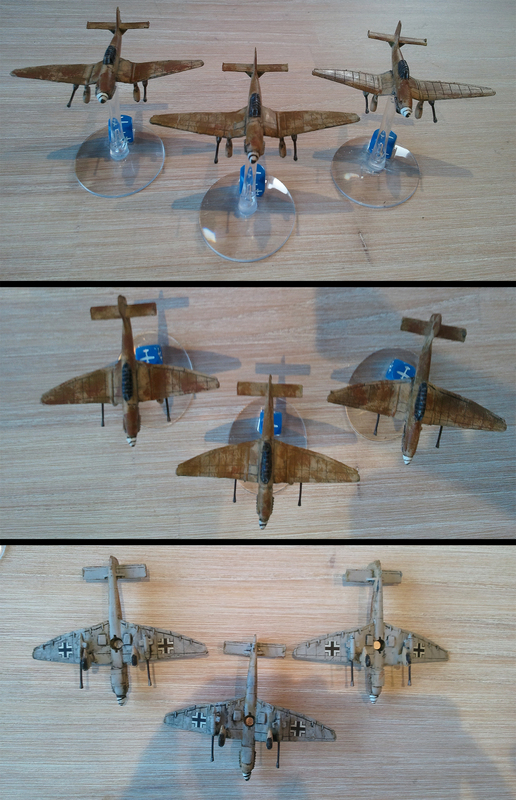 The Stukas are Iraqi Sand on top with Beasty Brown and Green Brown camo, the undersides are Stonewall Grey. Finally, my Flak 88 crew are in Khaki Grey with Iraqi Sand helmets and Beige Brown boots, the guns are Iraqi Sand. All fleshtones are Flat Flesh. I’m very pleased with the result (images below), a force totaling 1525 points which fits the Panzer Company force organisation chart without any hiccups There is plenty of room to expand, filling out my panzer platoons and adding a third being on the top of my list. For the meantime though, I need to get a battlefield ready for us to fight over! The whole force, ready for battle on my kitchen table. Command section with a Panzer IV F2 and Panzer III L.
The Flak 88s. I have painted the tractors, but I haven’t based them – I don’t think I will bother at this stage, they don’t really serve much purpose unless you are assembling the guns for towing. Panzer platoon with two Panzer IV F2s and a Panzer III N.
Panzer platoon with three Panzer III Ls and a Panzer III N.
Finally the Stuka Ju87G dive bombers! Welcome to Blind Wargaming. 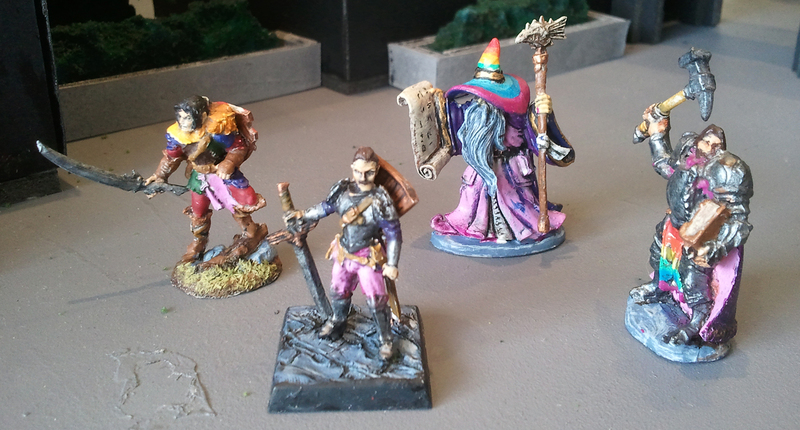 View the About page to uncover hidden secrets about my ongoing exercise to catalogue my tabletop wargaming fun times.